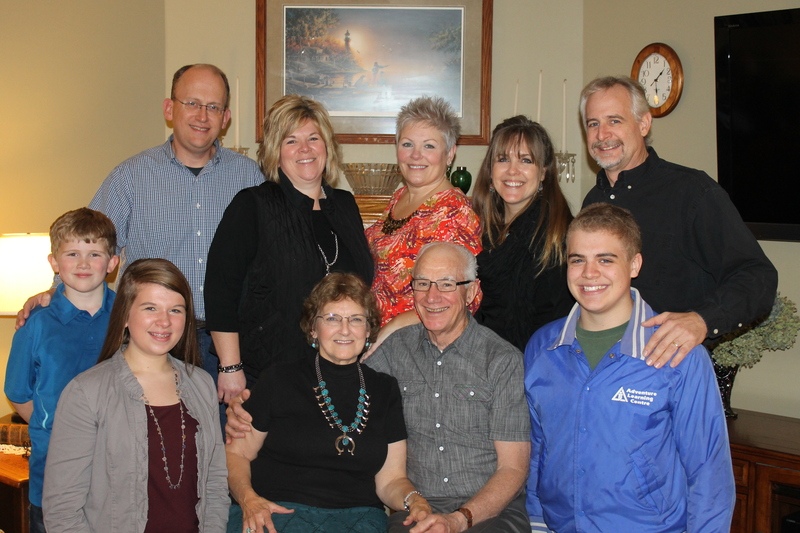 WLA mission team left behind the Hargraves. 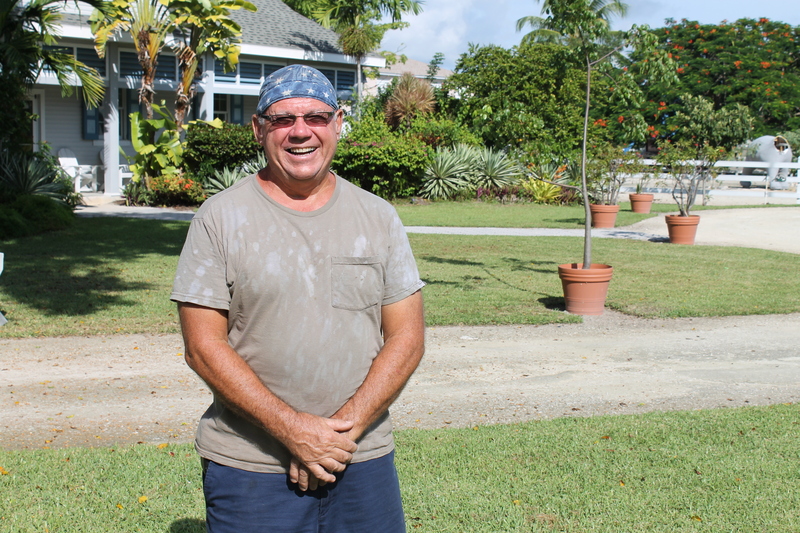 The Hargraves rented a home on the north side of the island. We had dinner at their rental home on Tuesday. Tim extended the lower bunk bed that Zachary slept on to make a frame for a double mattress. Now we have a place for our parents to sleep when they come. On Wednesday, the Hargraves joined us at our place for dinner. I began painting the screen door for the porch. Tim’s parents arrived on Friday, February 6th. Mom and Dad came here to the ALC over 25 years ago when Mom’s nephew Jon Stassel was working here and building the Centre. 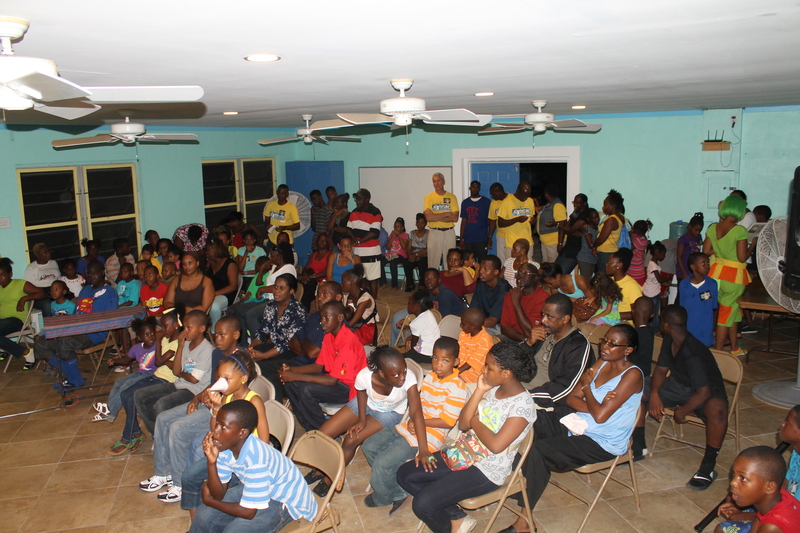 The first Youth Outreach meeting of February. From now until the end of the school year, we will be having youth outreaches on the 1st and 3rd Friday of every month. We divided into two teams. 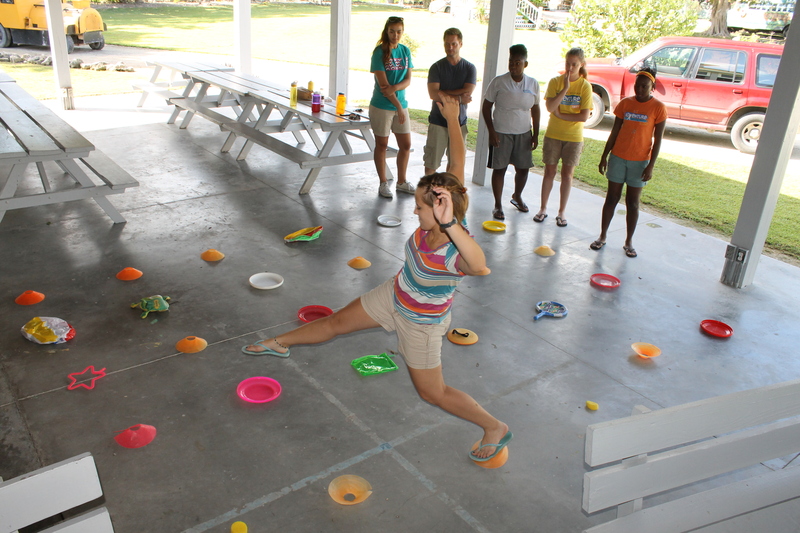 Each team will work to collect points by attendance, bringing visitors, winning team games, etc. Team 2 playing Family Feud. Bob and Pat have the (chilly) job of providing security at the front gate during the Outreach. Loving the space on the porch. What a blessing it has been! Dad worked on some finishing work on the porch. We are always quick to complain about the high prices of food here. Now $12.99 may seem like a lot (and it is) for ice cream, but that is at least $1 cheaper than it was. Gas prices may be contributing to the lower prices. Hallelujah! Playing our new game, Mexican Train Dominoes. Tim finished securing the porch by hanging the door. Dad helped us secure our house by installing bars on our windows. This is the window that was used by the person who broke into our house later last year. Bob, Dad and Zach cleaned up the last of the construction debris and leftovers. Celebrating the February staff birthdays: Celavia, Sean, Odissa, and Tika. 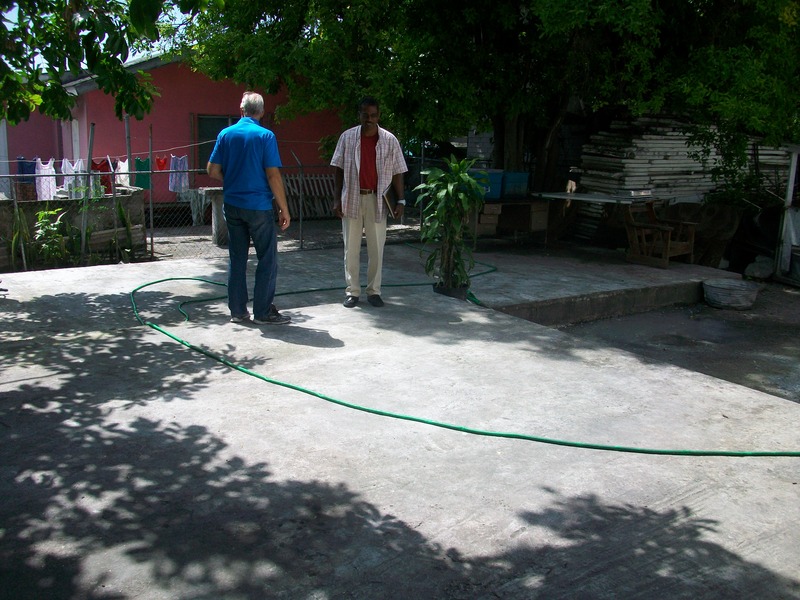 This past week we were able to meet with the directors of this disabled persons facility. 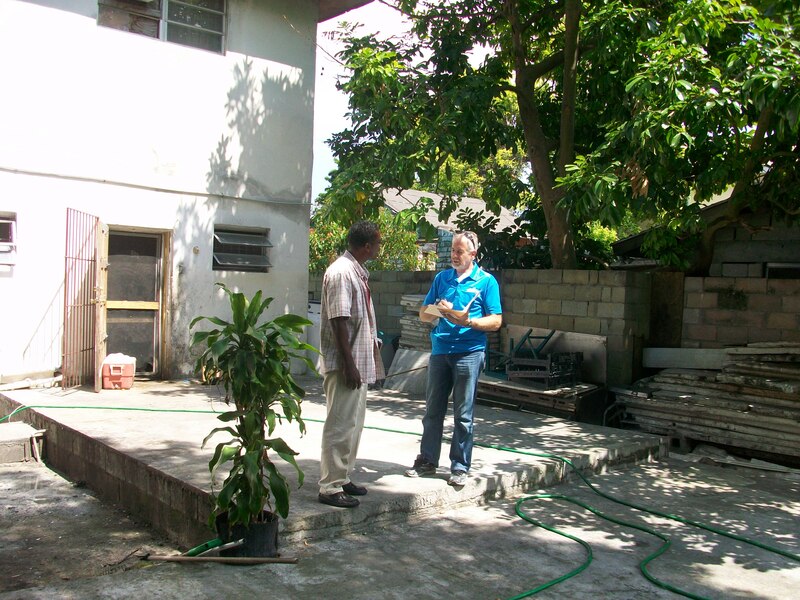 We have some mission teams inquiring about ministering here. 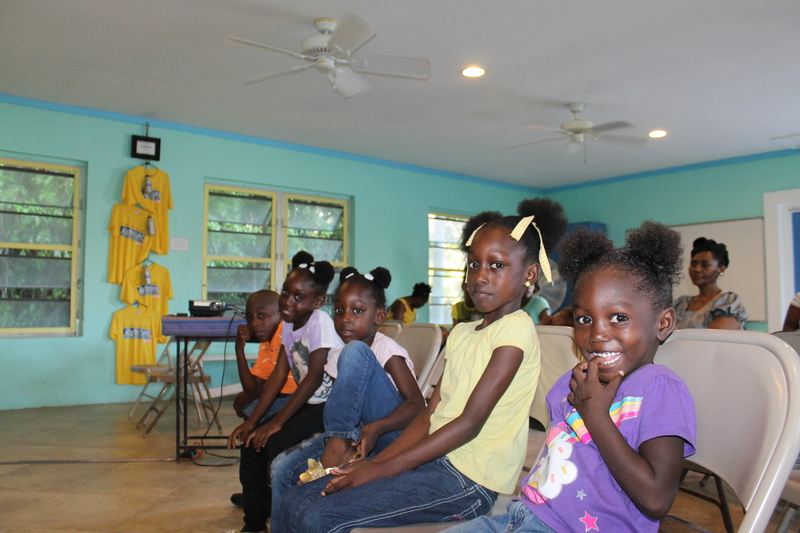 One of our biggest joys is getting to see the children at the Centre enjoying their day as they learn about God’s Creation. Dilan Van Ryn (one of our new facilitators) is doing a fantastic job with the kiddos. Meeting of the minds (well, sort of). Discussing maintenance issues. Megan with one of the groups doing what many of the children enjoy doing the most, riding the train. 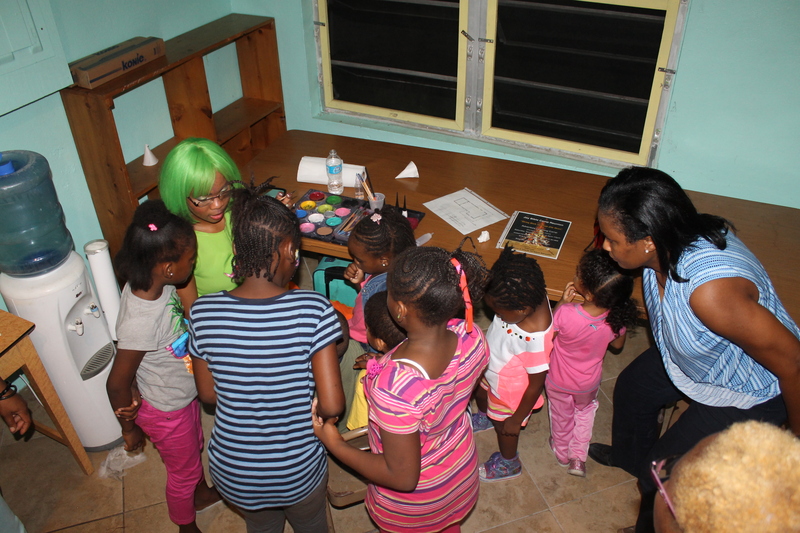 Another group of children at the Centre. 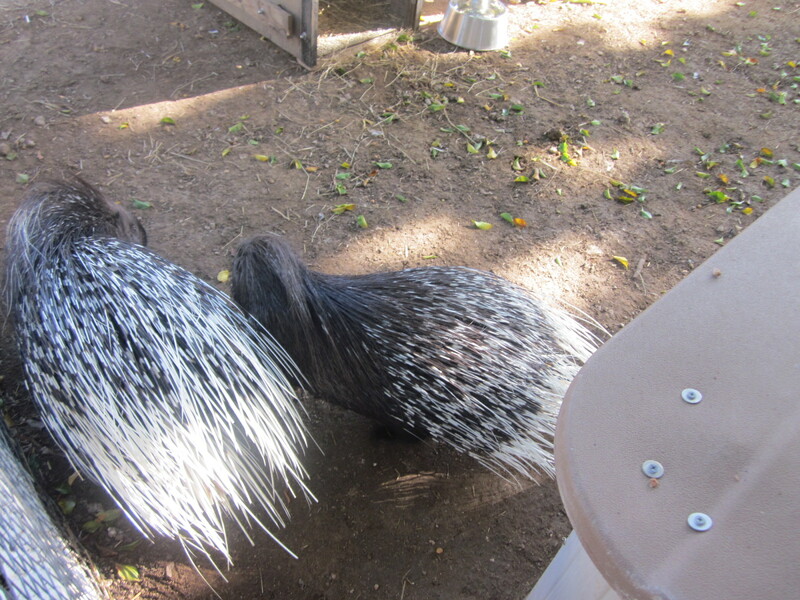 Tim’s parents got to see the newest animals at the Centre, our Indian Crest Porcupines. 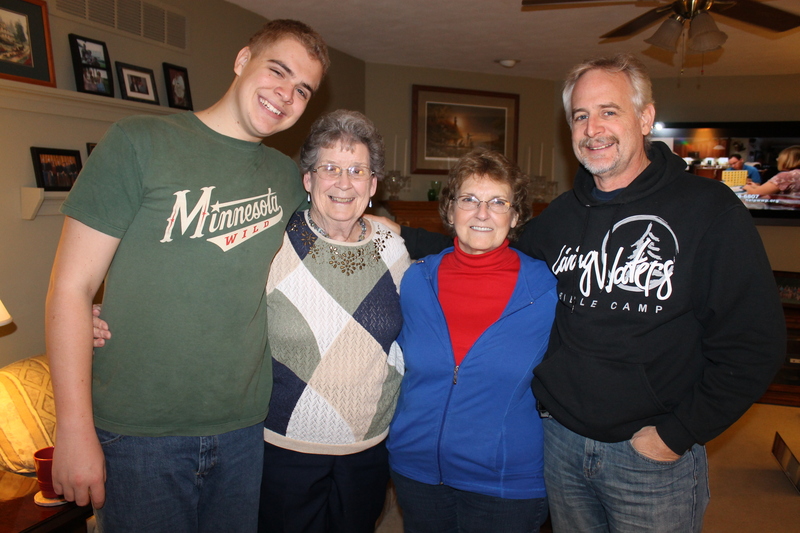 Dan and Doris Hauber from Canada were visiting their son on the island. Tim’s parents knew them from a long time ago and had the opportunity to meet with them for lunch. 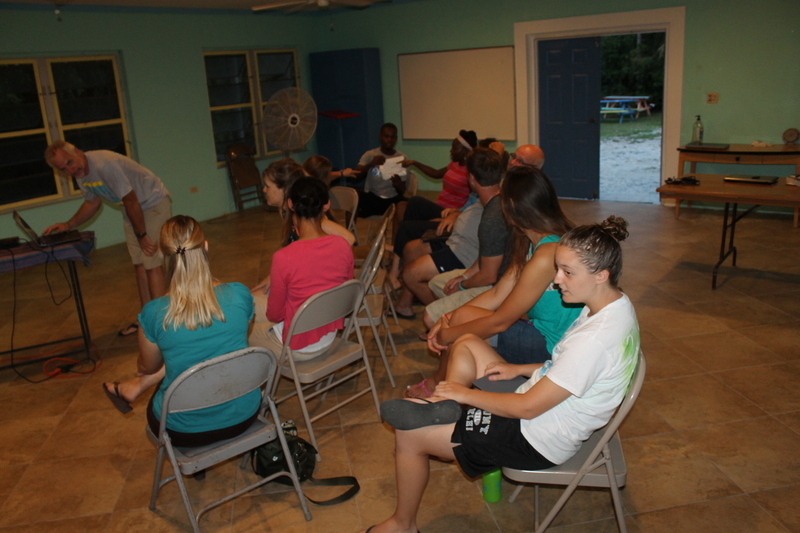 Wednesday the 11th was our first night back with our church small groups. Love these dear people! 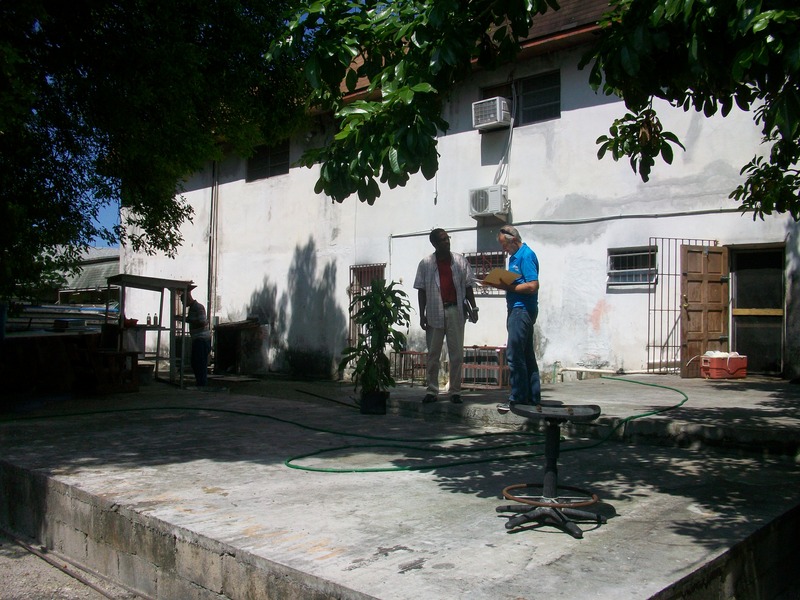 This week during devotions, we got to hear one of our grounds keeper’s testimony. What an encouragement. On January 2nd, the staff started returning. Sam was the first to return. On the 3rd, after 3 trips to the airport, Bob and Faye, Bob and Judi, and Megan returned. We fed them dinner their first night back. Sunday was the last opportunity for Logan to get together with some young people from Kingdom Life before he left that next Tuesday, so we met with the Moss’s at Dairy Queen. On the 4th, Josie returned. Sad day, putting Logan on a plane back to Minnesota for a second time. We hated seeing him go again, but it was easier this time than it was in June. …and a beautiful Bahamian sunset. 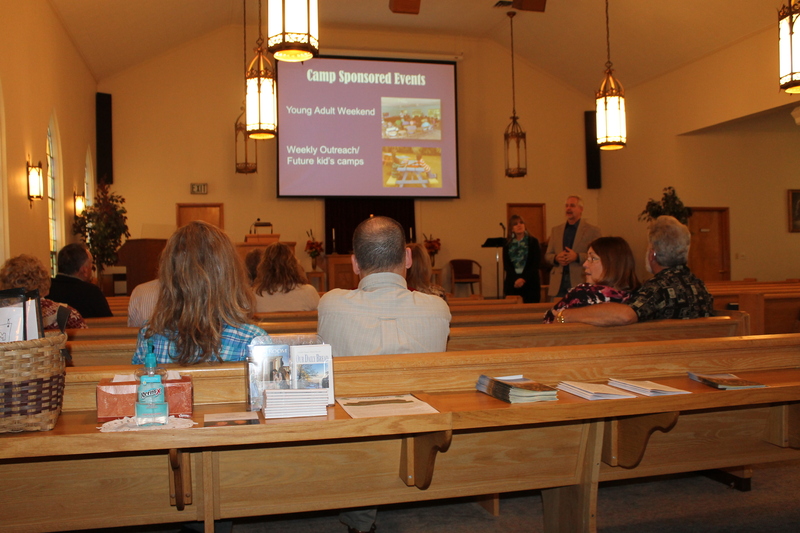 …and welcomed Calvary Christian Academy 8th Grade group 1. 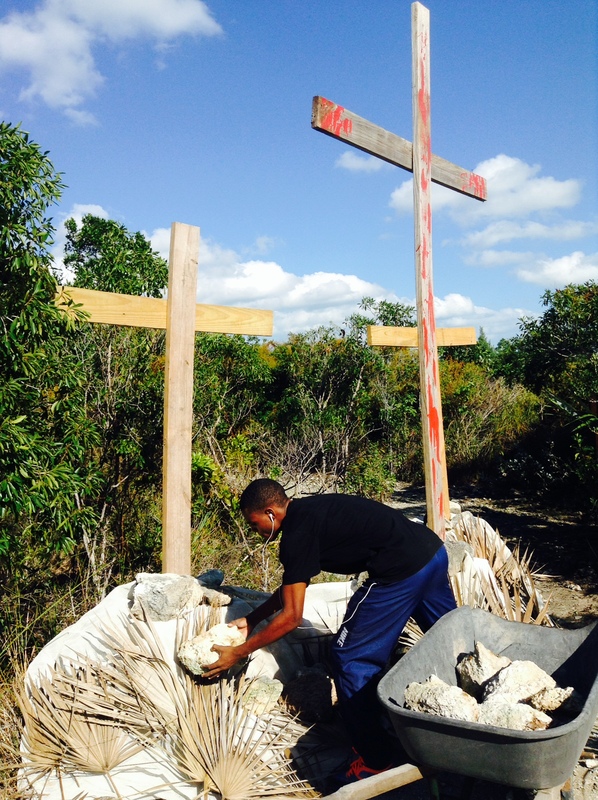 The 97 8th graders and their leaders were on a mission trip in the Bahamas. On the 9th, we played Mexican Train Dominoes. This was Josie’s last night on the island. Zachary even went with us to the airport to say good-bye to Josie. 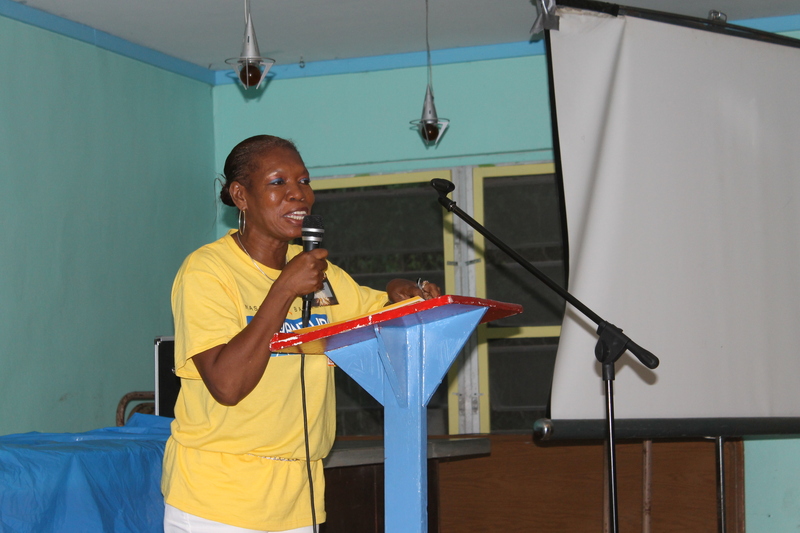 On Saturday, January 10th, we said good-bye to Josie Sorena who had been a facilitator at the Centre since September. 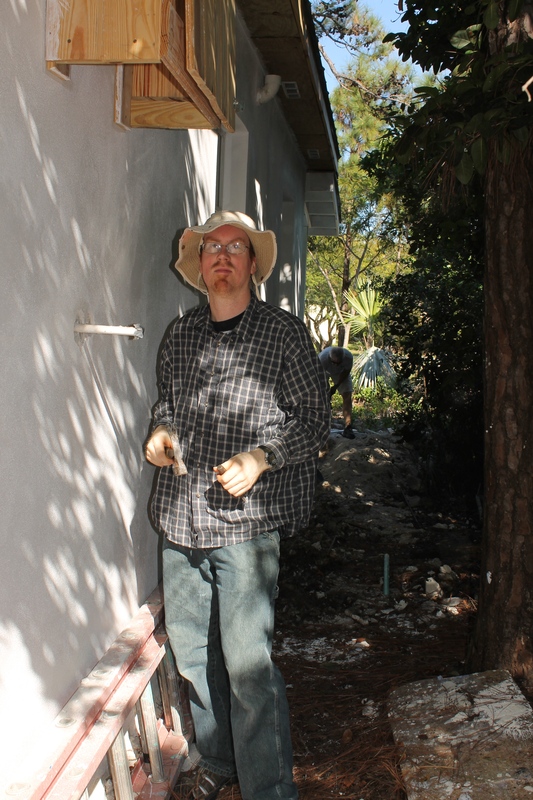 All while serving both Calvary Chapel 8th grade groups, Tim was working on the new staff cottage trying to get it finished so the girls could move into it and free up their cottage for a couple coming to work at the ALC the following week. 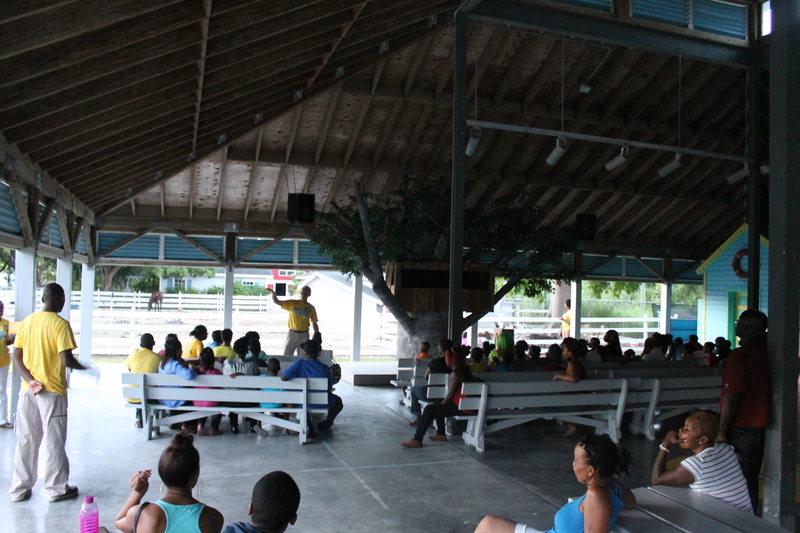 Planning for our Friday night Youth Outreaches continues. 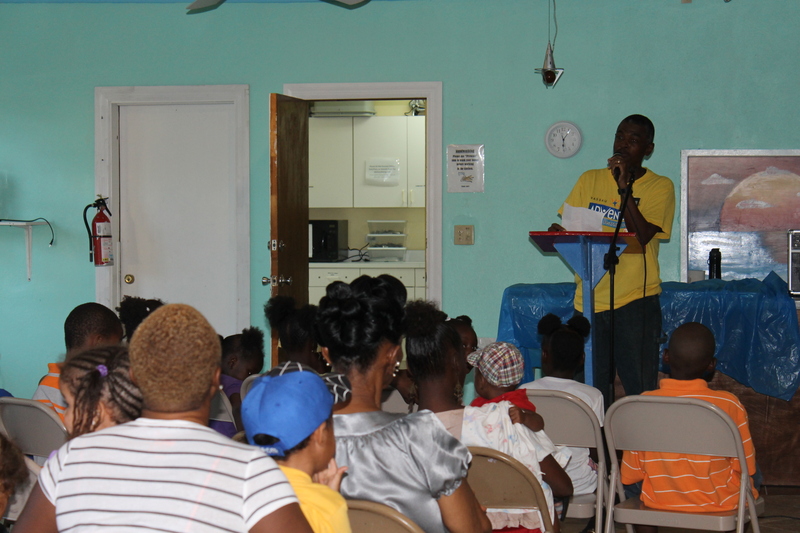 Youth outreaches increase from once a month to twice a month. 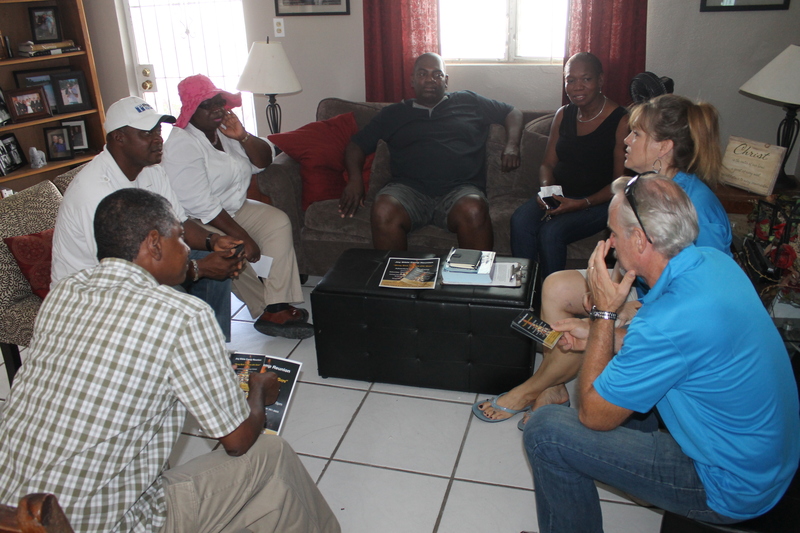 On January 13th, we were able to pick up the Lucht family at the port and show them around the island. 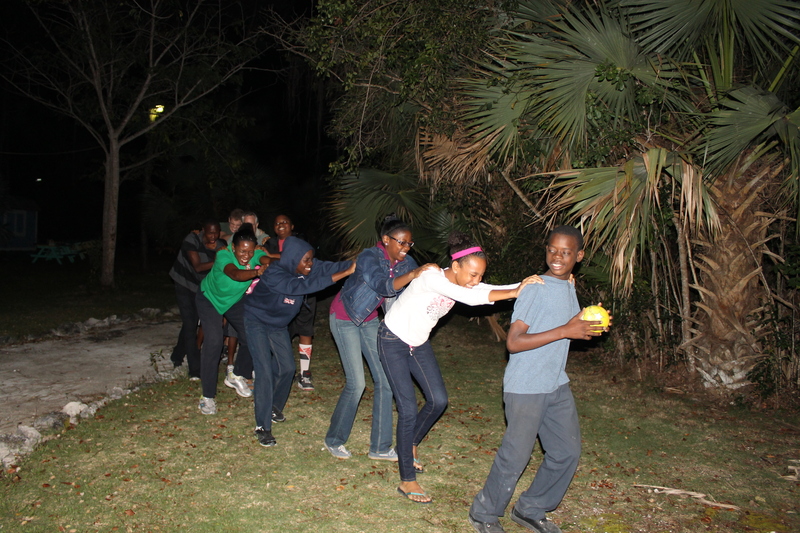 Group II of the Calvary Christian Academy 8th graders arrived on January 14th. …plumbing repair, fixture installation, security bar installation, etc. We picked Pat and Janice Armstrong up at the airport on the 2oth. 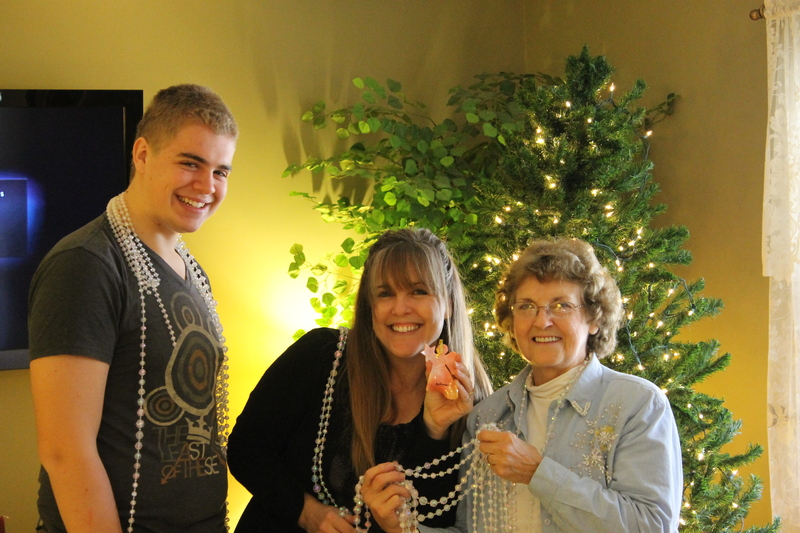 Pat is in maintenance at the Centre and Janice is Tim’s office assistant. 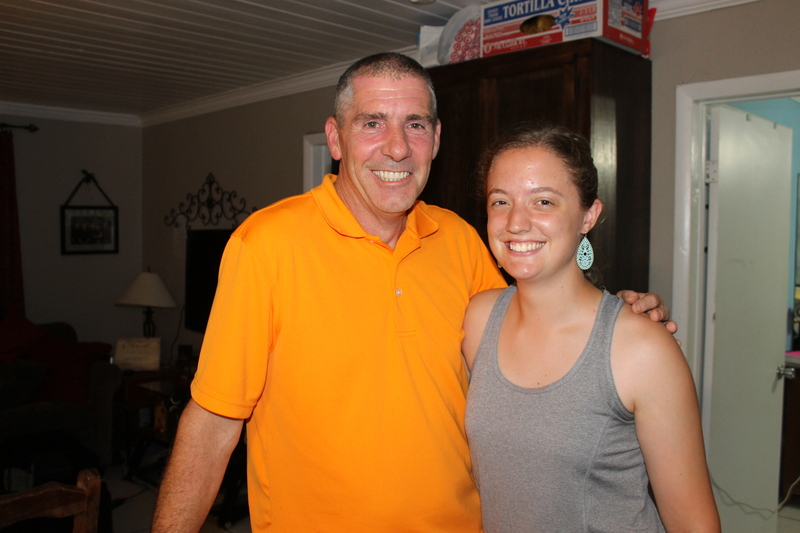 We welcomed Pat and Janice to the island with dinner at our house. 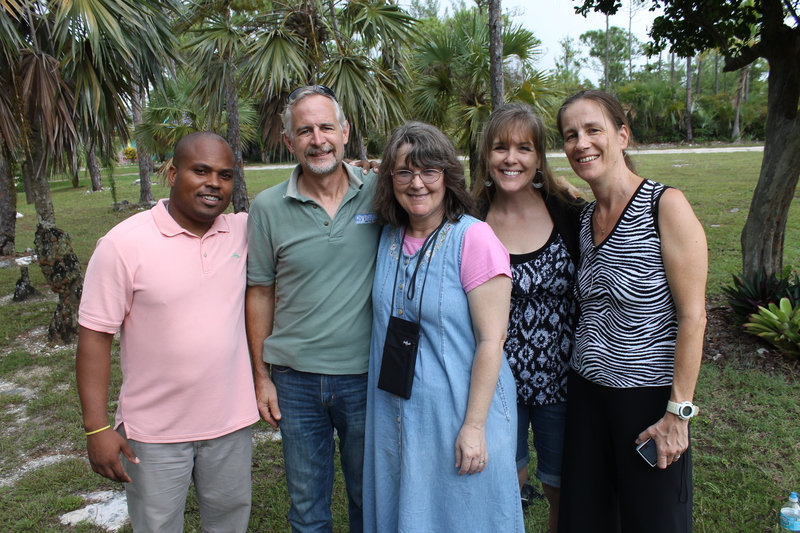 On the 21st, we welcomed new facilitator staff, Dilan and Laura Van Ryn. We had them for dinner their first night on the island. …and celebrate the January staff birthdays. 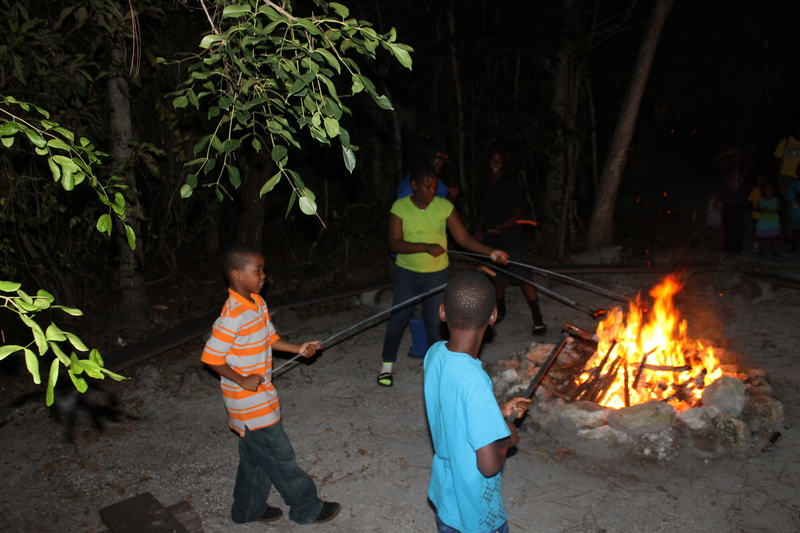 On Friday night the 23rd, we had our last monthly Youth Outreach. 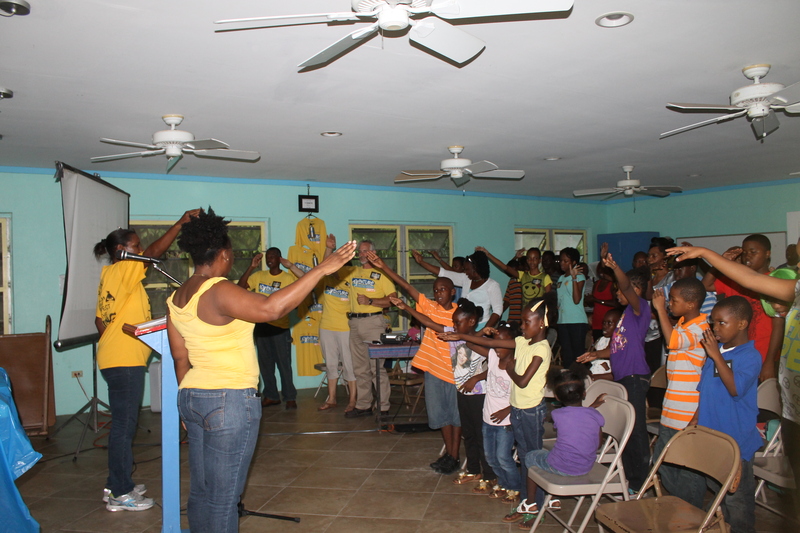 The staff joined in with the young people during the game time and fellowship time. During Bible Smugglers, some of the “Bibles” victoriously made it back to base. …keeping it on the end of the straw was not always as easy. 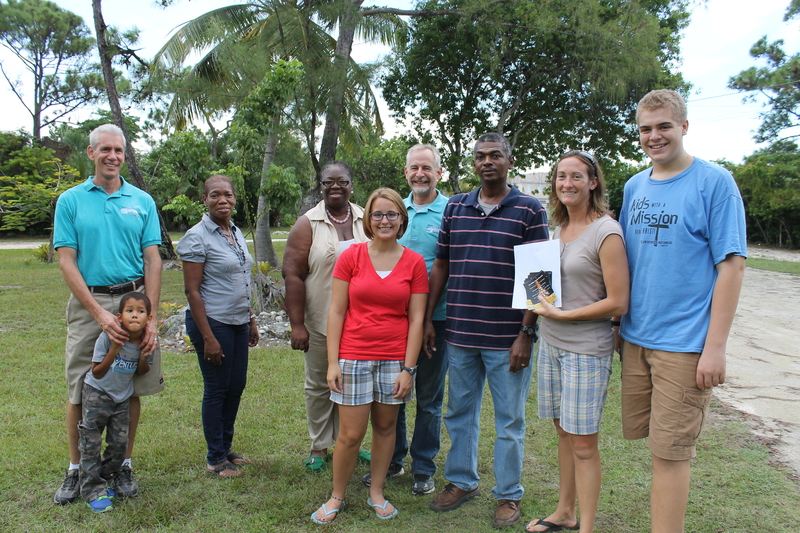 On the 24th, we went to the airport to pick up a mission team coming to serve the Bahamian people. 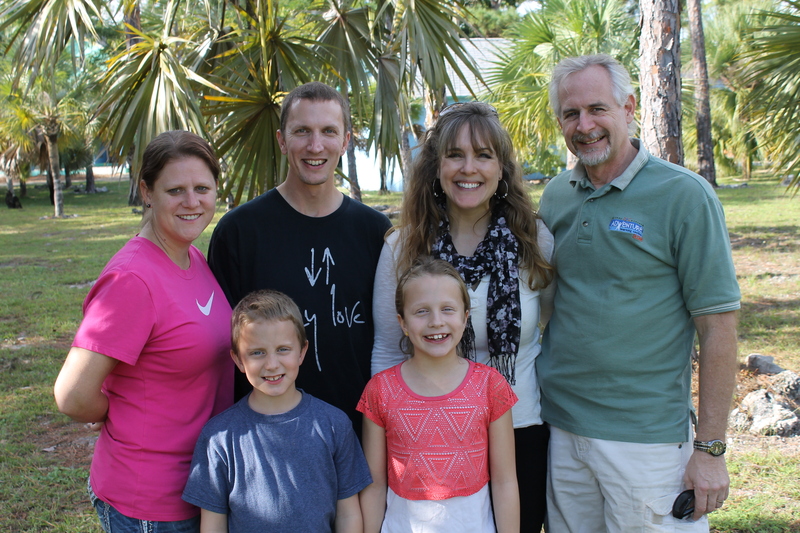 The team we picked up were from Bob and Faye Brownings church in London Ontario, Canada. West London Alliance Church were a great group to serve alongside. This is Velcro. He is a service dog for one of the young ladies on the mission team who is blind. Sarah with Velcro and others on the team. 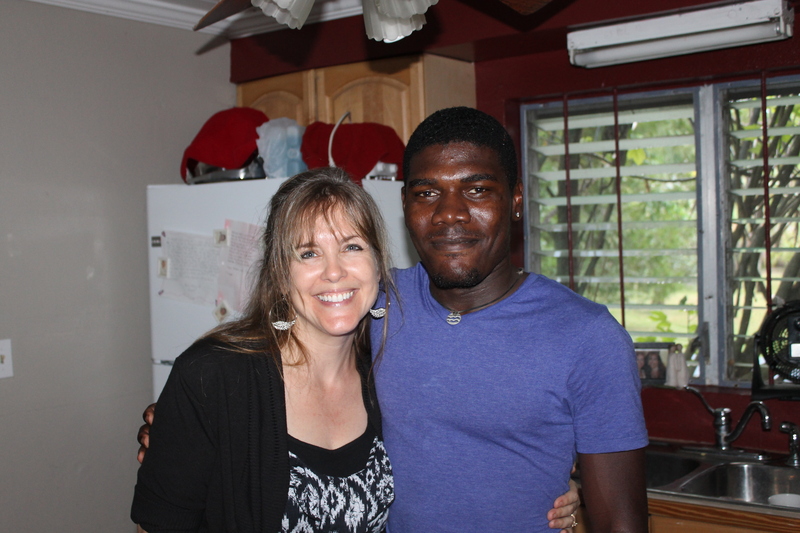 On Monday the 26th, Janice began working with Tim as his office assistant. 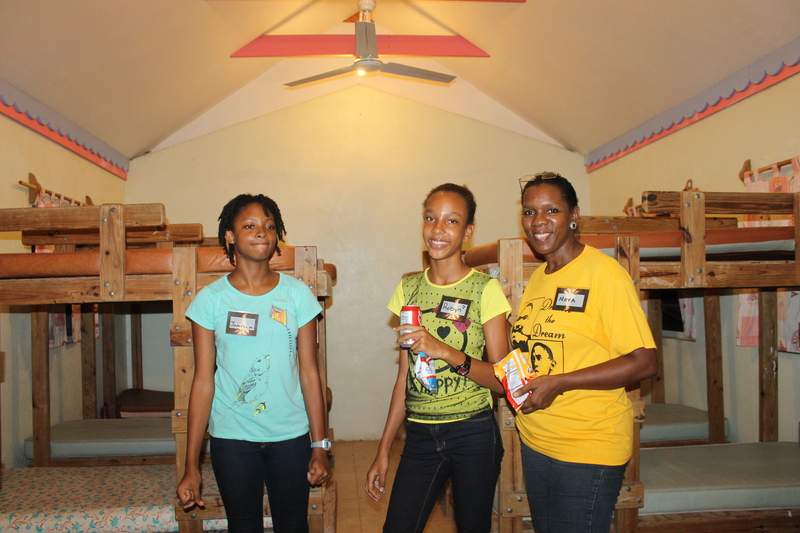 The mission team went to serve at All Saints Camp. Since there are some not so nice dogs at All Saints, we got to “dog sit” Velcro for the day. We loved having the dog. Demolition work on the roof of the house. Megan was on the West London Alliance Church mission team. She is a nurse and helped me arrange medications in the nurse cabinet in the camp office. Having fun for the picture. 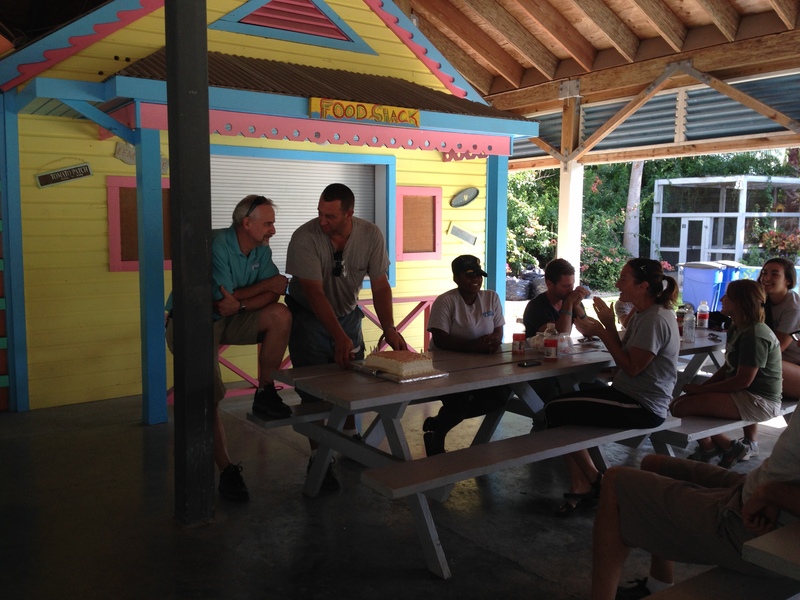 The work crew from WLA got a lot accomplished that first day of work on the camp house’s screened in porch. 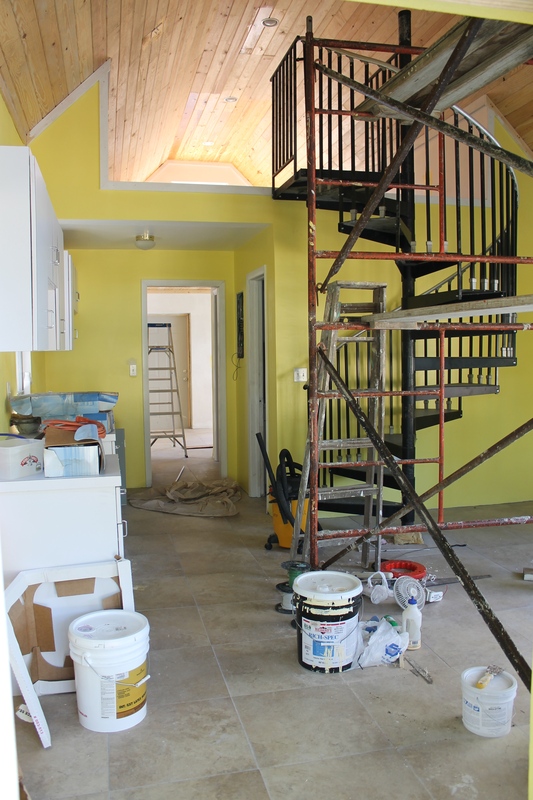 They also helped clean and paint the new staff cottage. On Wednesday the WLA team went downtown to the Straw Market. 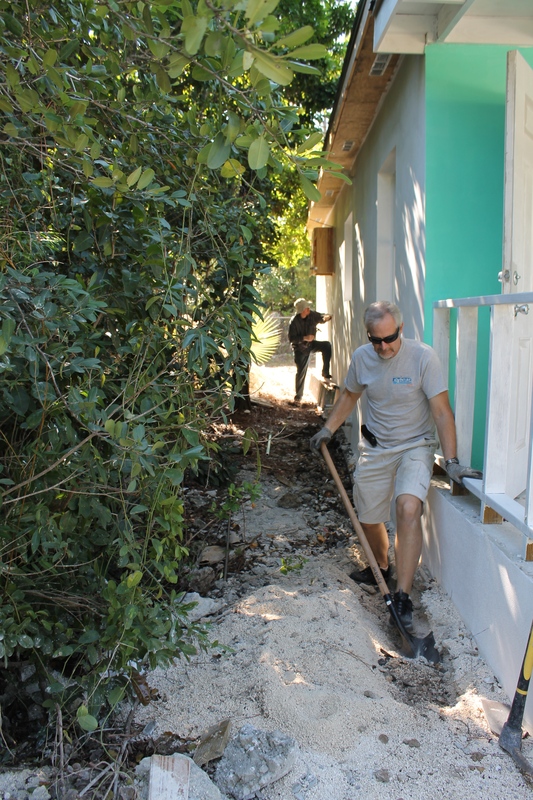 Ron decided not to go, but opted to stay back and work on the electricity of the porch project. We had him for lunch at our house. Day 2 of the screened in porch project began. What does one do when a ladder leads to a roof? They climb the ladder to get a different view of the world. Day 3 began with completion of the ceiling and addition of screening and trim work. 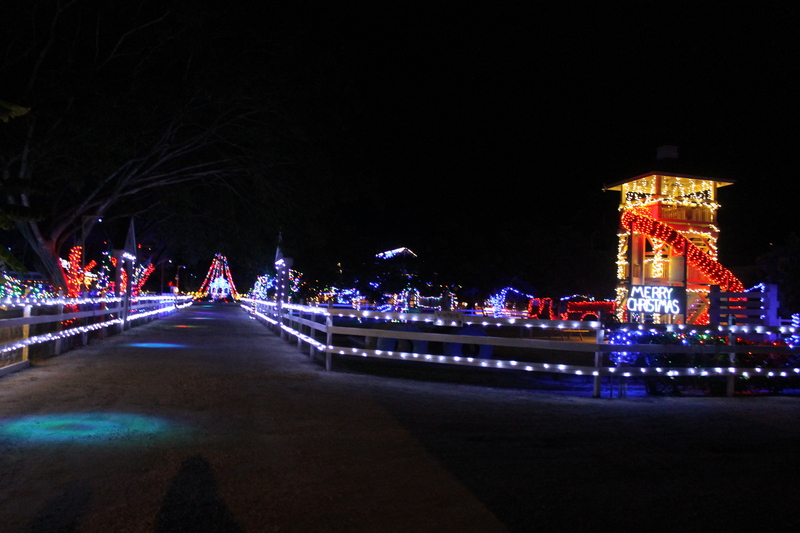 Lights and fixtures were also put in place. Zachary started helping late on the 3rd day. His height would have come in handy that day had we thought about it. The group worked late into the evening trying to get the project completed. Saying good-bye to Velcro and Sarah on the day they departed. Posing with the WLA team that blessed us with the wonderful screened in porch. The work crew posing on the roof of the porch. 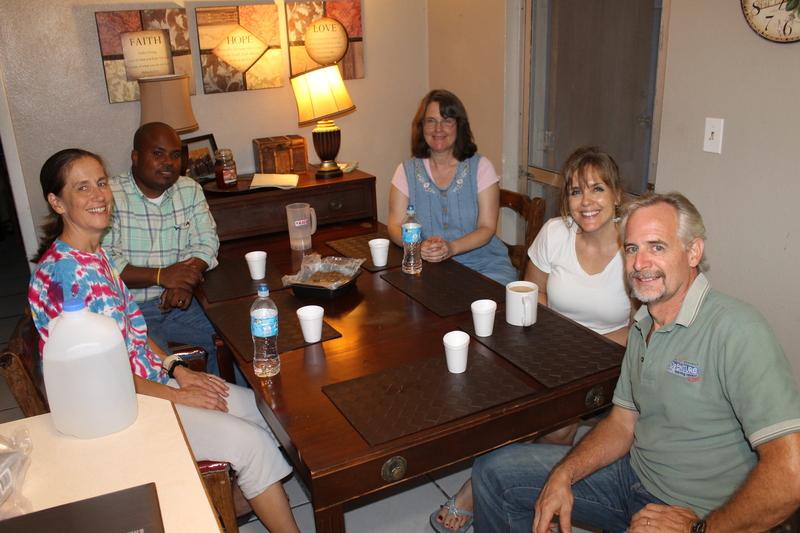 The afternoon we took the team to the airport, we enjoyed our first coffee break on the newly screened in front porch. On Sunday, we had the gang over for Tacos after church. It is so nice having room to spread out! Super bowl party at the Seeley’s house (the only place with a television). 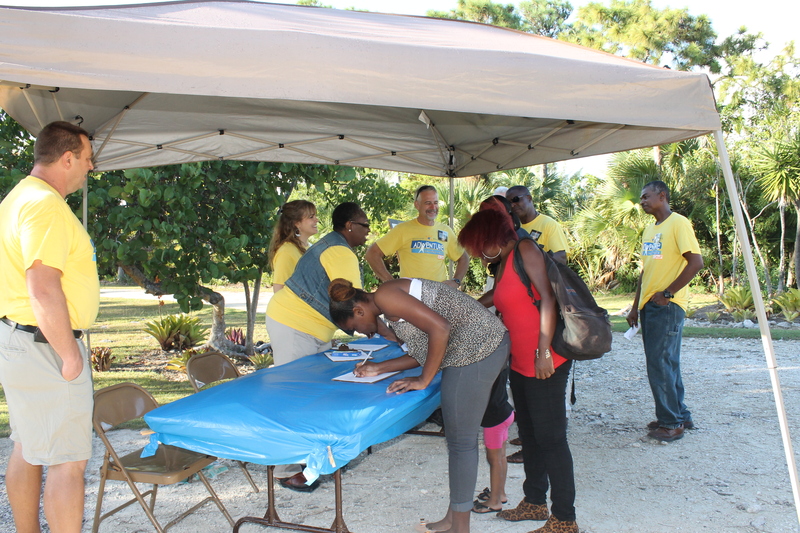 On December 14, we welcomed Florida Atlantic University students who were in Nassau for a medical mission trip. Garrett came in on December 14th. We took Tika to the airport to fly to Colorado on the 15th. Josie (left) and Sam (right) left on December 15th to go home for Christmas. 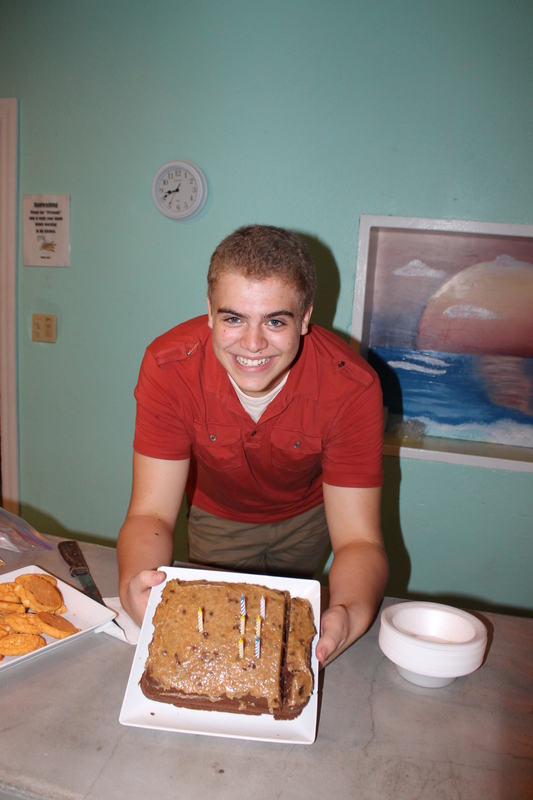 Serving the 45 FAU young people was a challenge without staff, but everything worked out. 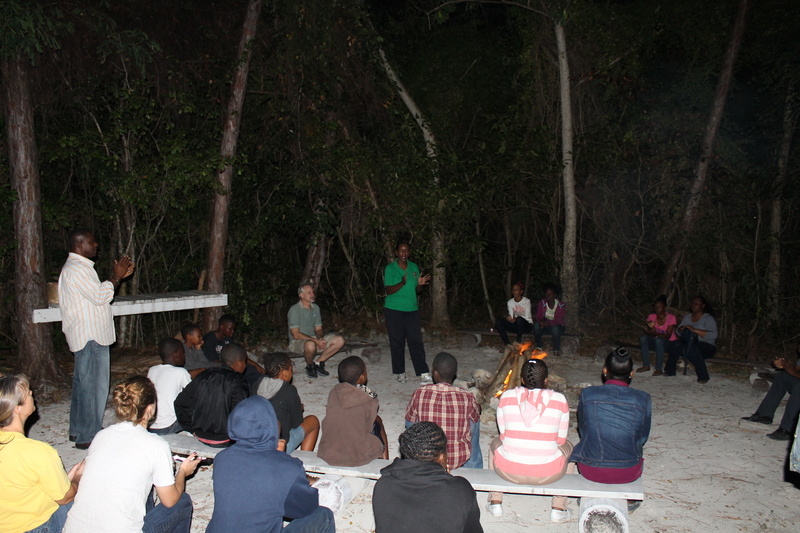 FAU at their evening debrief time around the Camp fire. Tuesday morning the 16th, Bob and Judi and Pat left for Christmas. Aaron Mills was a huge help to us as we served FAU, prepared the Camp for large January mission teams, and fixed broken equipment. Megan left for Christmas on the 16th. Tim had many broken water lines to the new cottage to repair. 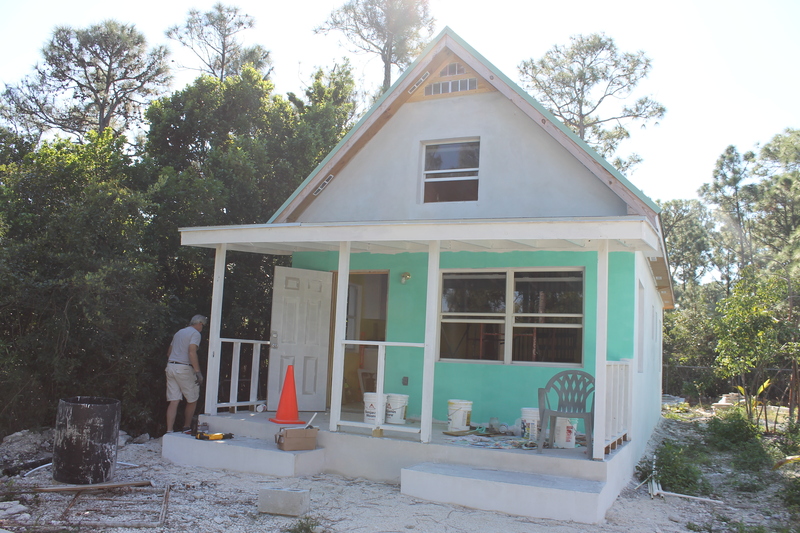 Aaron was a huge help in getting the paint and varnish applied to the new staff cottage. We could not have done it with out him. Garrett also helped a lot. After dropping FAU off at the airport on Friday the 19th, we picked Logan up. Lee Burtelson, ALC&C board president came in on the 19th as well. He and the kids played Settlers of Catan as they did in June when he visited. Saturday, December 20th, Andrew and Katie arrived. Lee Burtelson took us and Mark Wallace and Cranston Knowles out for dinner at the Poop Deck. We took the kids to see Atlantis after dinner. Sunday morning it was good to see Logan back on stage with the worship team. Sunday with all our kids at our church was a dream come true for this mother. We introduced Andrew and Katie to the Centre, and they met Felix the cat (they love cats). …and a sunset at the Pirate/Slave stairs. 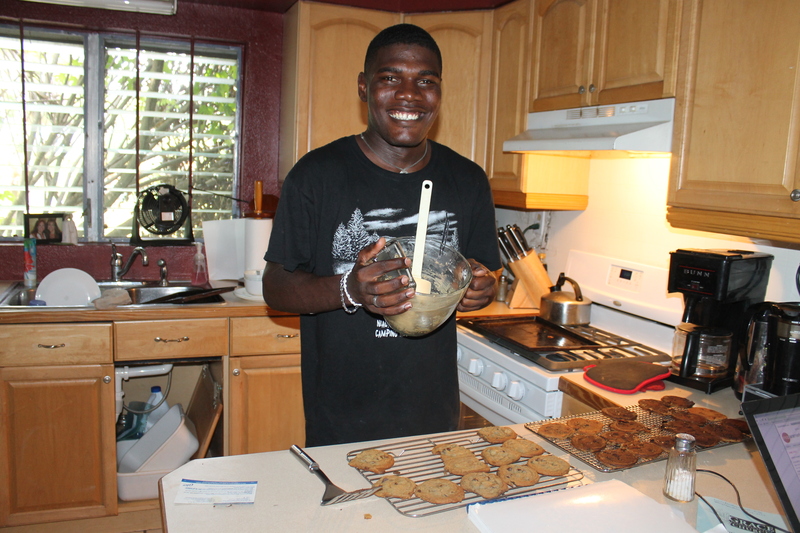 Our dear friend, Oralee Johnson made conch fritter batter so I had some to share with our kids. What a sweet gesture. The first time in over 5 years that we had all the kids home to decorate the Christmas tree. Zachary waited a long time to get to be the one to put the tree top on the tree. An accident involving our angel left our angel in pieces. This angel has been our tree top for 24 years. I did shed a few tears. Dream come true: Christmas together as a family! 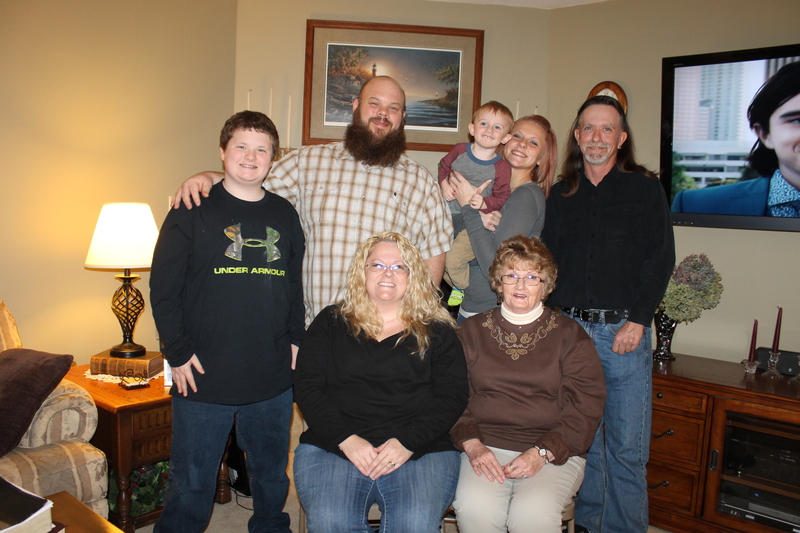 It has been many years (at least 6) since we had been all together. After the traditional reading of the Christmas story, we exchanged gifts. Christmas dinner included our family, Aaron Mills and Pastor Cranston. …and relax at the beach. …before taking Andrew and Katie to the airport to start the painful good-bye process. …and picked-up Logan’s friend Alex. Wednesday morning we took Aaron to the airport. …then to Paradise Island to ring in the New Year. Those of us that welcomed in the New Year with thousands of other people at Atlantis. There was a beautiful fireworks display at midnight in Marina Village..
On Saturday, November 22nd, my cousin Tracy picked us up in Chicago and took us back to her house near Lafayette, IN. 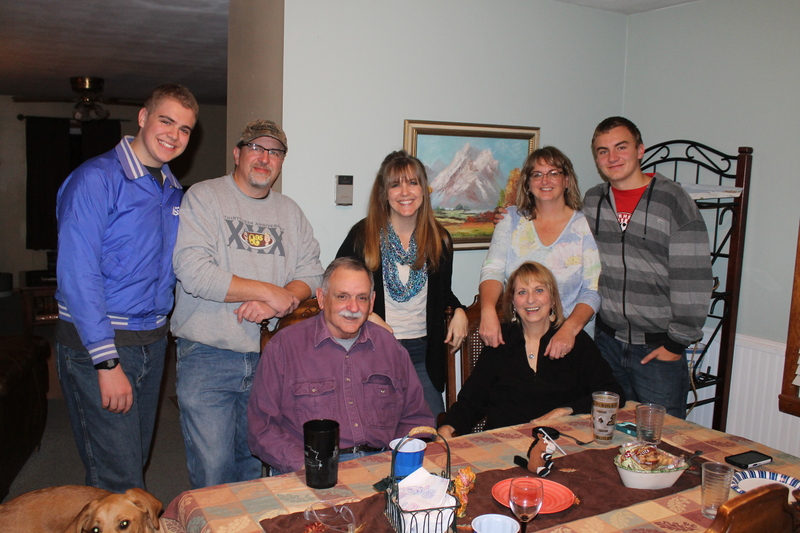 We got to visit with her, her husband Brian, her son Jeremy, and her parents (my Uncle Raymond and Aunt Carol). 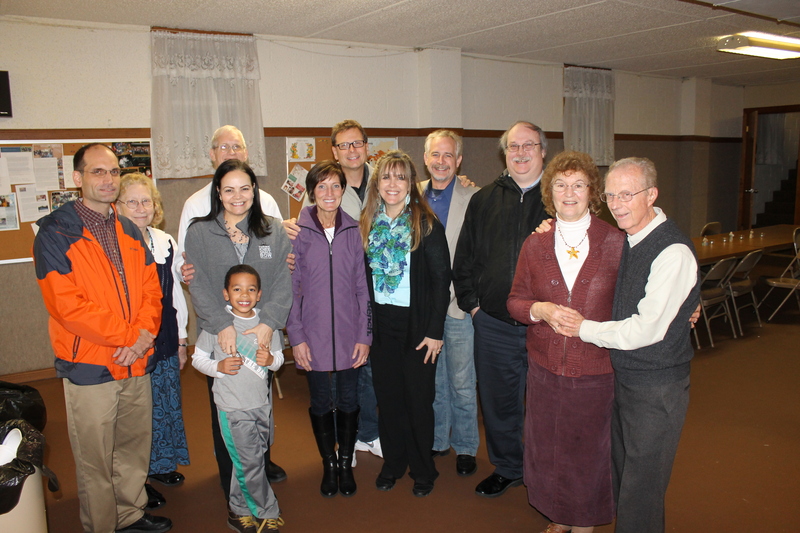 Following our update at Hillery Bible Chapel, we had a salad dinner fellowship. 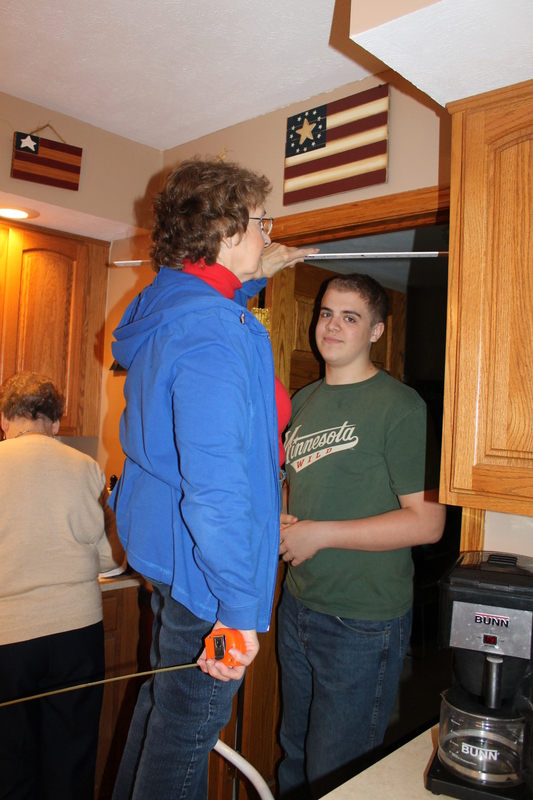 When Zachary was at Grandma’s in June, he was almost 6’3. Grandma wanted to remeasure him. He is now 6’3.5. Still taller than anyone else in the family. 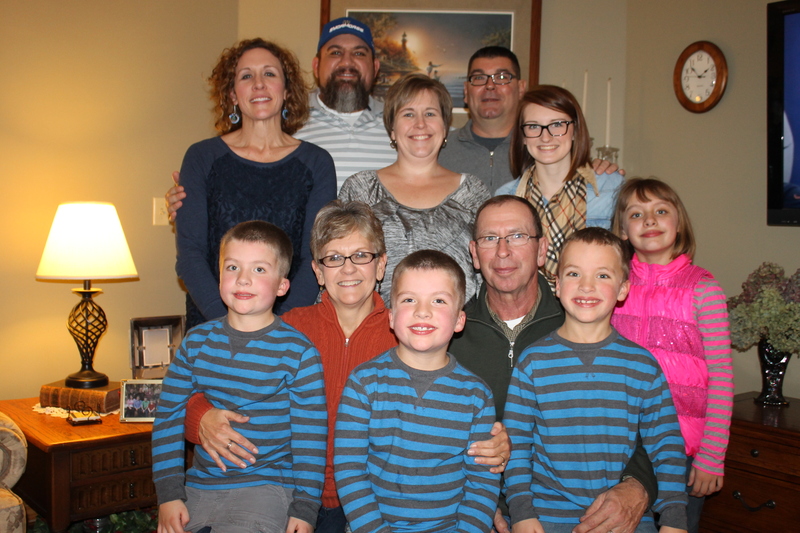 The week of Thanksgiving we were able to spend some down time relaxing, getting caught up on emails, shopping-packing-shopping-packing, watching Hallmark Christmas movies, and visiting parents and grandparents. Thanksgiving dinner was at my parent’s house. This is my parents and two of my sisters. 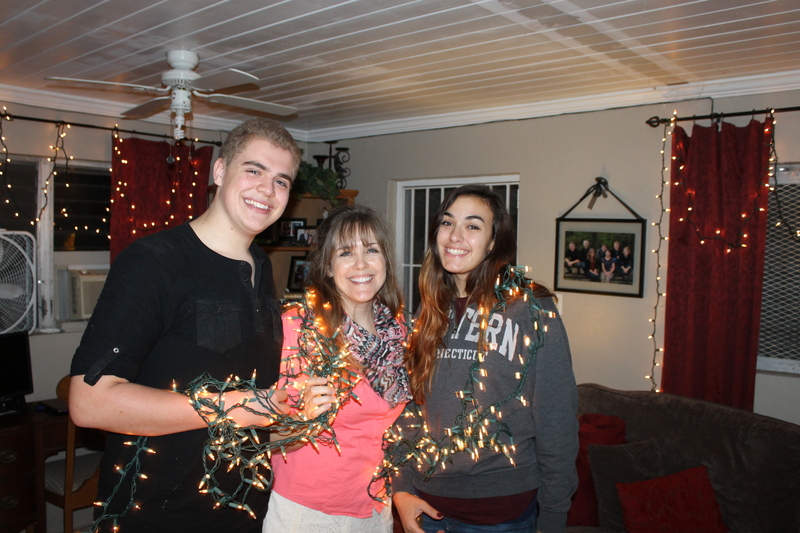 After Thanksgiving, we helped Mom decorate for Christmas. 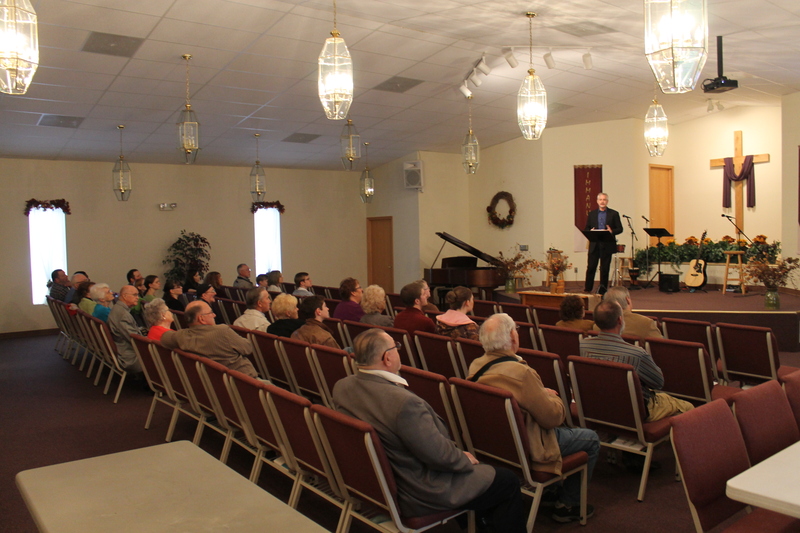 On Sunday the 30th, Tim shared an update with Edgewood Baptist Church and then preached afterwards. Edgewood is the church I grew up in. 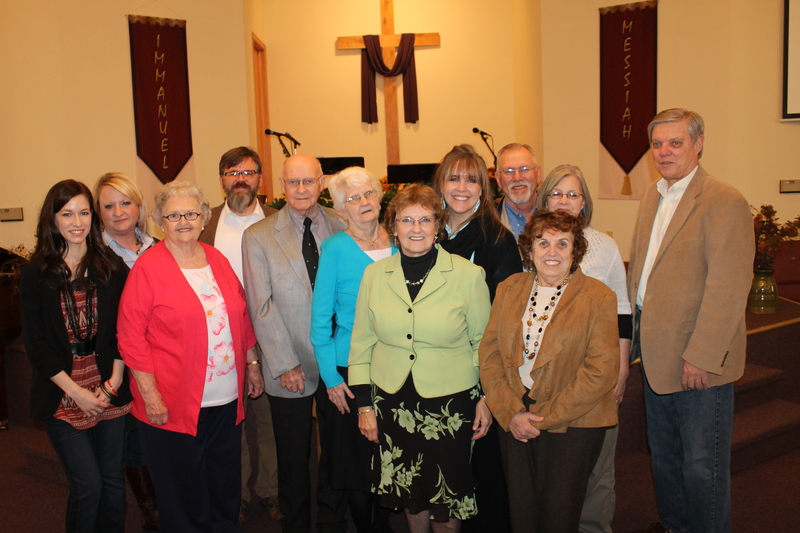 Here are some of the original Edgewood Baptist people that I grew up attending church with. Sunday evening we visited my step dad’s mom. Helen is the mother of 4 boys. Being a mother of 4 boys myself, I love these mother son pictures! She is 93 years old and still lives alone. Of course the boys take very good care of their momma. Our welcoming home party on December 1st! We packed 9 suitcases and 3 backpacks with the few personal items we took to the States with us and all the extra supplies we purchased. Because everything is so expensive in the Bahamas, we try to bring a lot of stuff back with us. We also get $300 each worth of stuff duty free when we return, so we took advantage of it! Paying $40 for the three extra bags was still worth it. 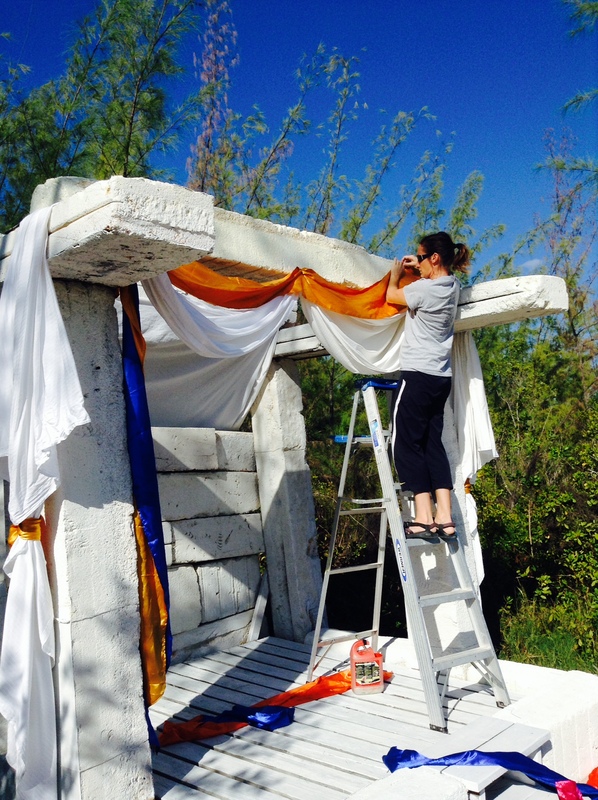 More pictures of the preparations. 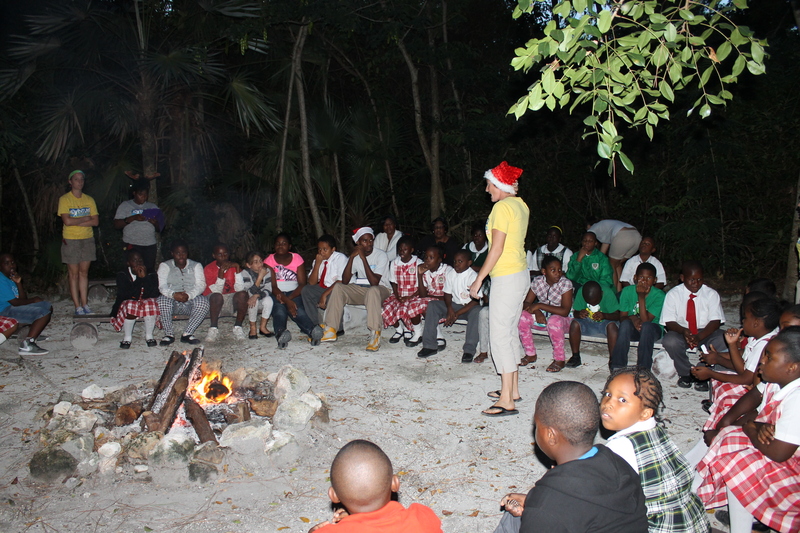 The Centre Facilitators had a Christmas party for the after school Adventure Club kiddos. 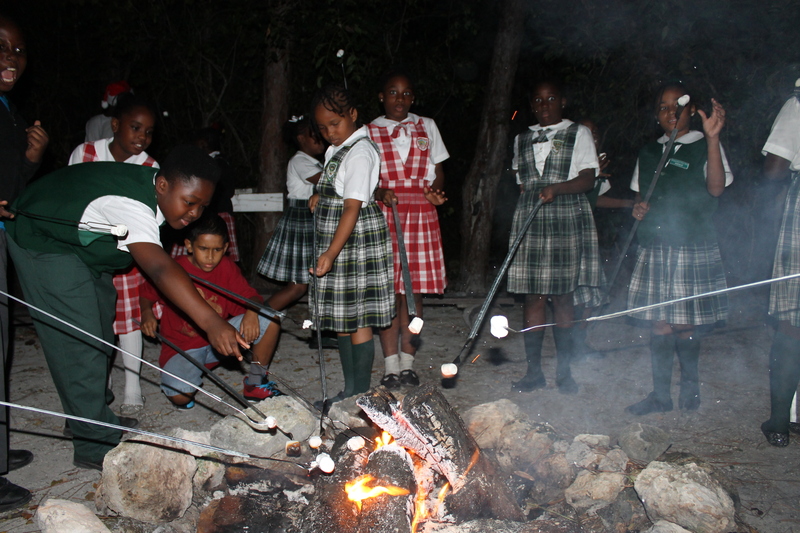 One of the activities was a campfire at Camp. We love having kids at Camp. 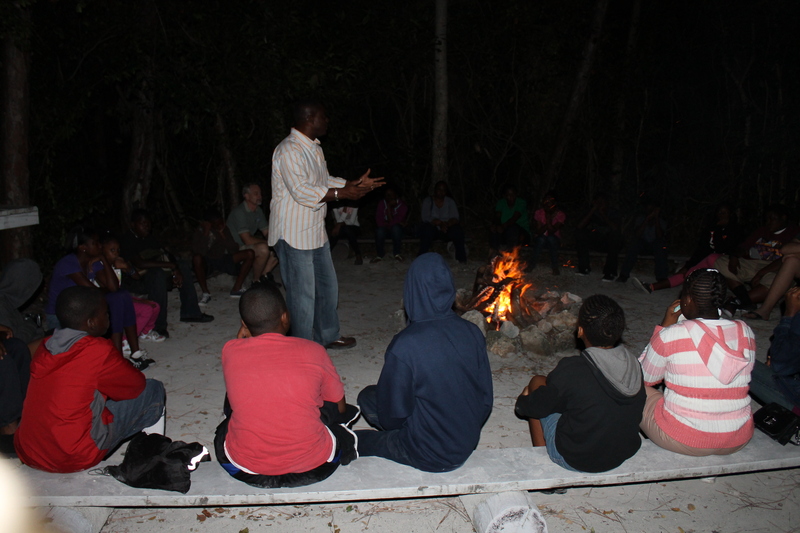 Our first Friday back on the island we were able to participate in the monthly youth outreach at Camp. Our own Moya led us all in a time of singing. Jen and Elton helped lead game time. 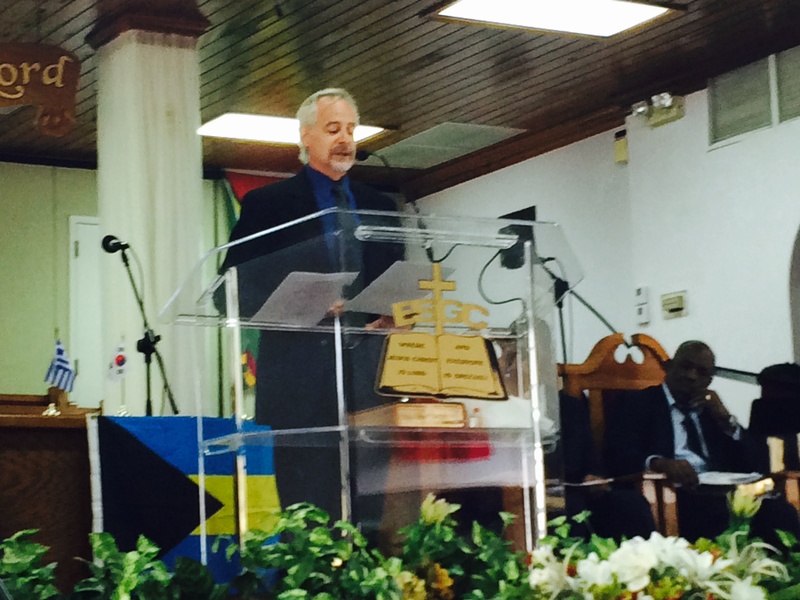 Teddy Bootle gave a challenge from God’s Word. 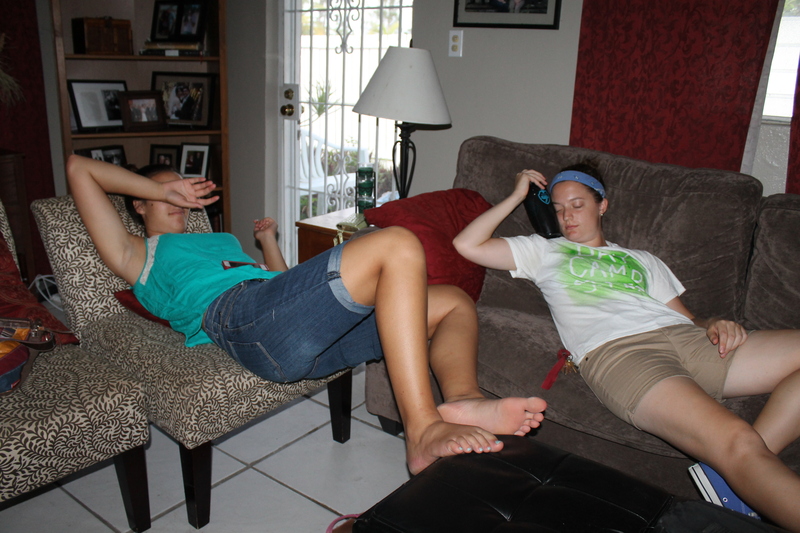 I LOVE having girls around. 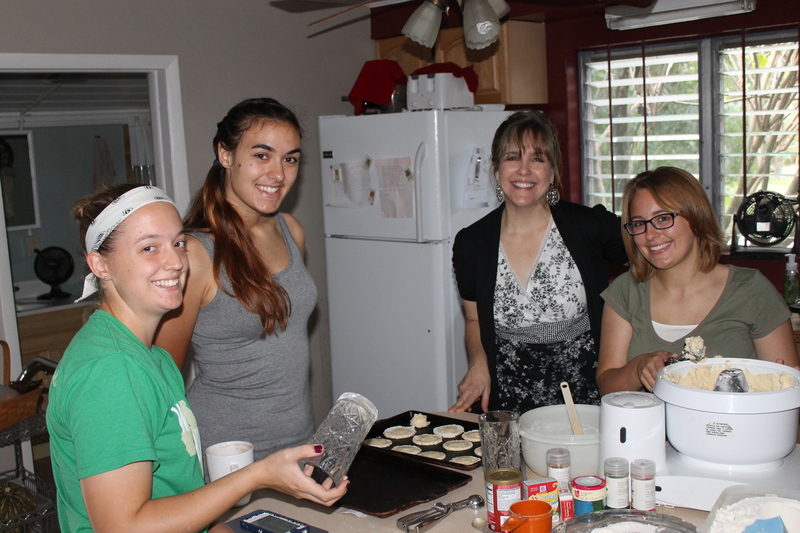 We spent Saturday the 6th making Christmas cookies together. 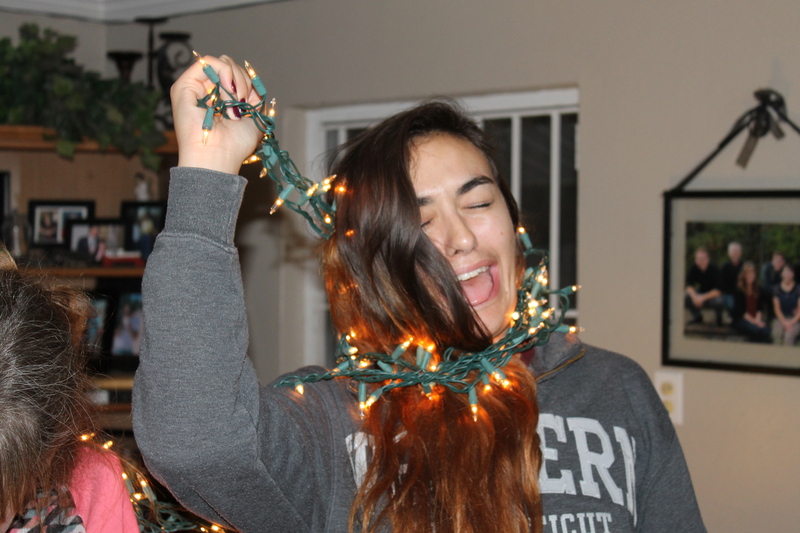 Silly Josie helping us decorate the house for Christmas! We decorated the house but have left the tree to decorate when all of us are together the week of Christmas! On the 10th, Denise and Cliff Young (we stayed with them when we were in Atlanta) and the kids came through Nassau on a cruise. We picked them up at the port and spent the day with them. Our friend Aaron Mills came on the 10th and will be with us for a few weeks. He is a great help to us and has such a servant heart. 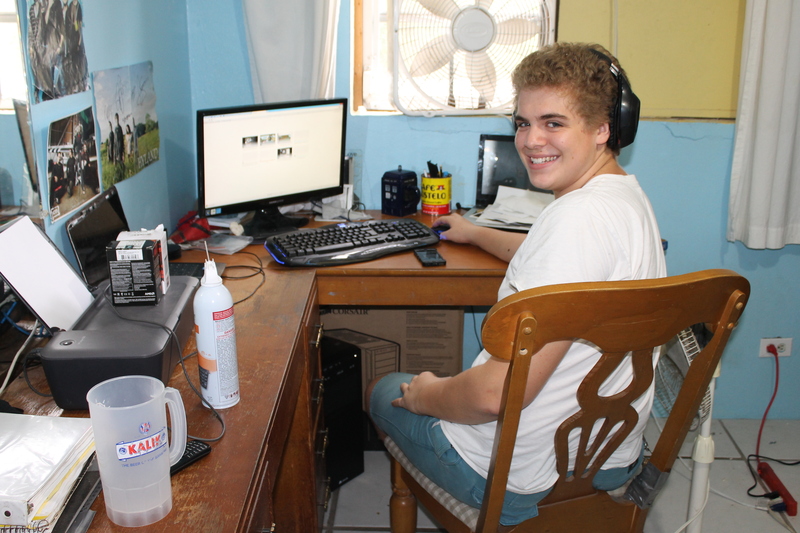 Now that emails, correspondence, and planning for this weeks mission team has been completed, Tim has been able to direct some of his attention to working on the new staff cottage. There is still a lot of work to be completed on this cabin before it can be lived in. 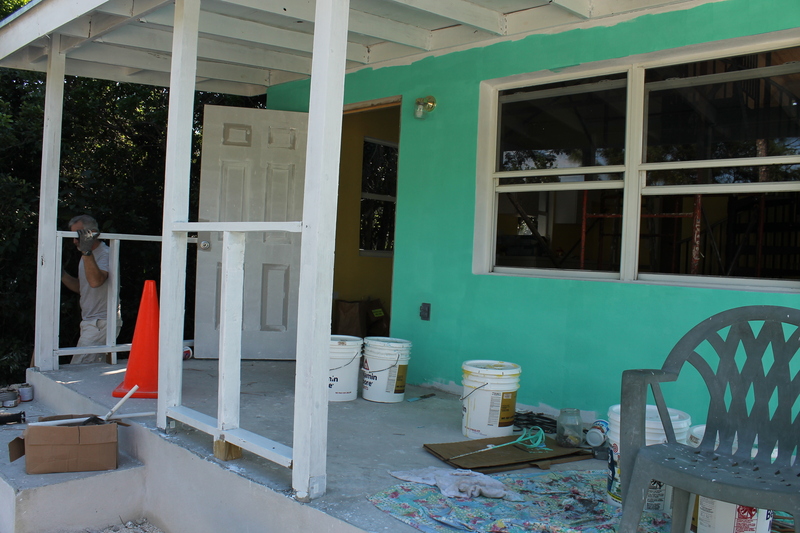 Judi and the facilitators have been working on painting the cottage inside and out. A peak at this inside of the cottage. Right now the girl’s staff cottage is home to bunk bed pieces. We will be reassembling these beds in the new cottage over the next several weeks. 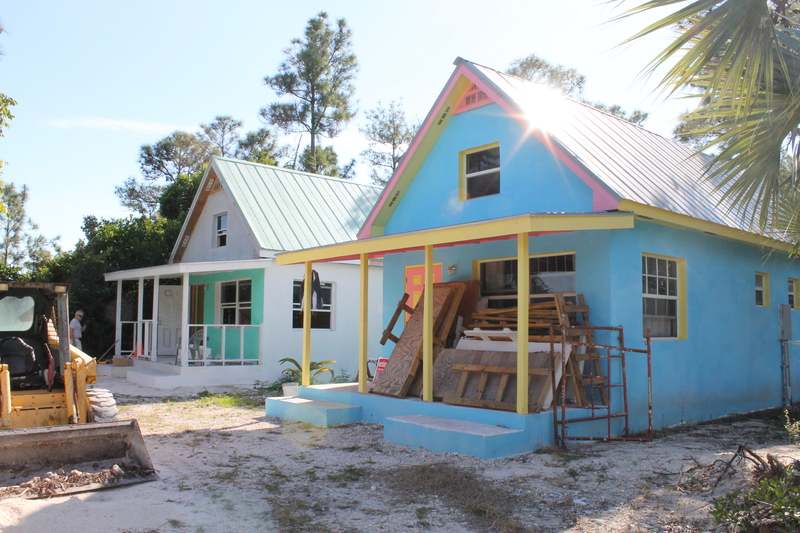 We have 2 mission teams of about 90 each that will need to use the new cottage for sleeping quarters. After the group leaves on Jan 18th, the beds will be removed and we will finish the cottage to house the girls so our new maintenance director and his wife can move in to the cottage the girls are using now. A lot to do over the next few weeks! Pray for us!!! 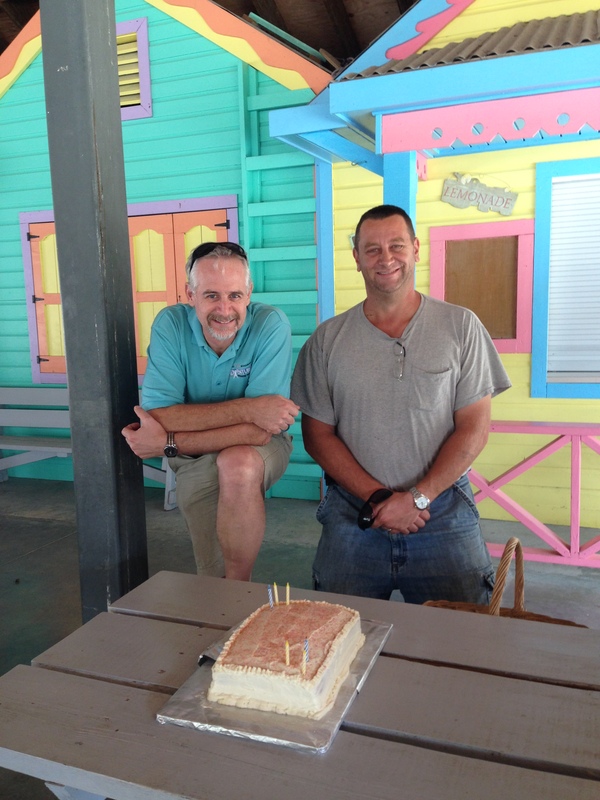 This week we celebrated September and October birthdays (Bob September 11th and Tim October 27th). We like to gather as staff to celebrate birthdays every couple of months. September was too crazy busy and October we left the island for our trip. We used last week to get “caught-up”. 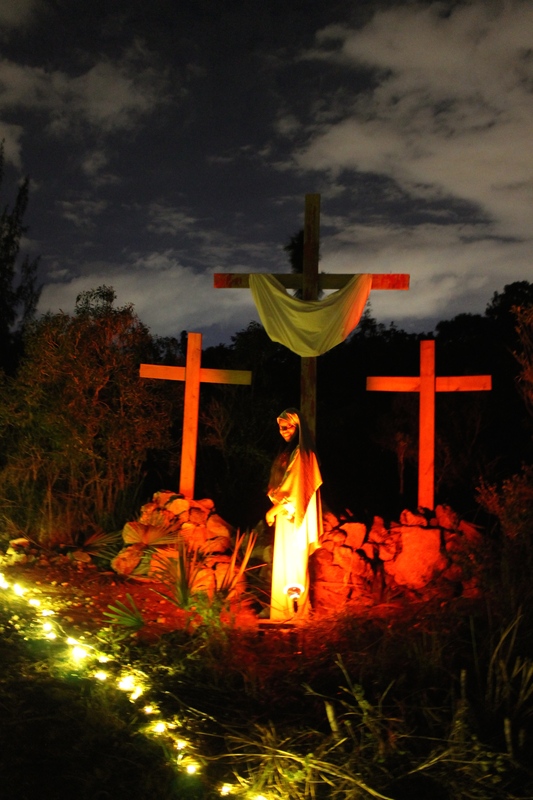 …and a spectacular pageant depicting the Christmas story: birth of Jesus, life of Jesus, and death, burial and resurrection of Jesus. 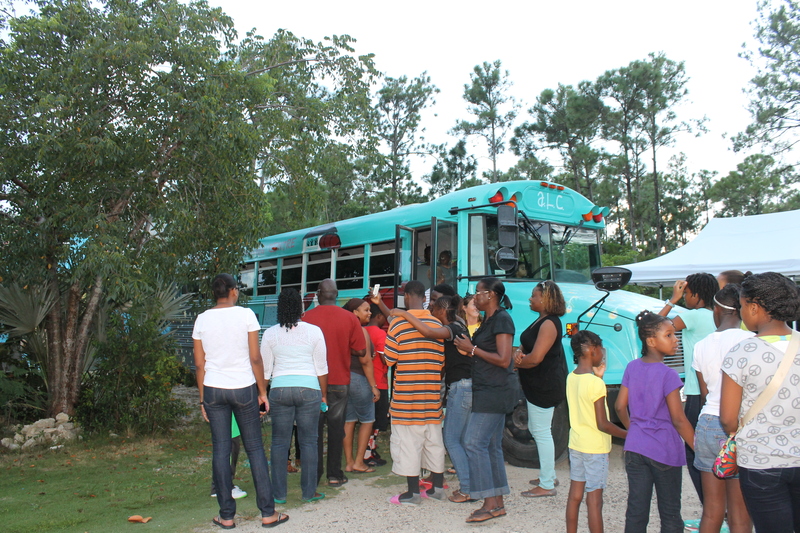 On Saturday, September 20th, we had the last neighborhood canvassing walkabout to announce the Joy Bible Camp Reunion to the South Beach Community. Also on the 20th, we welcomed aboard Pat Armstrong (on the left) as maintenance man here at Adventure Learning Centre and Camp. His wife Janice will be joining us in January. Sam Howard (right) is from the same church as Pat and was glad to see someone from home. 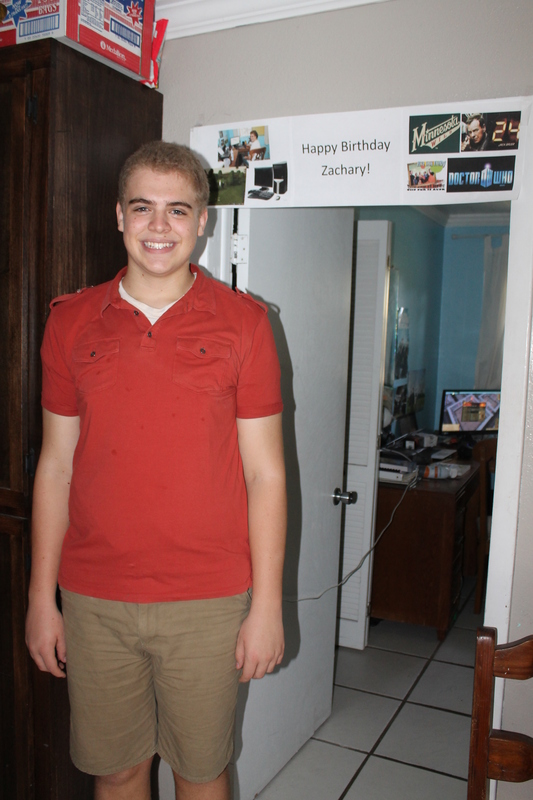 On Monday, September 22, Zachary turned 16 years old. 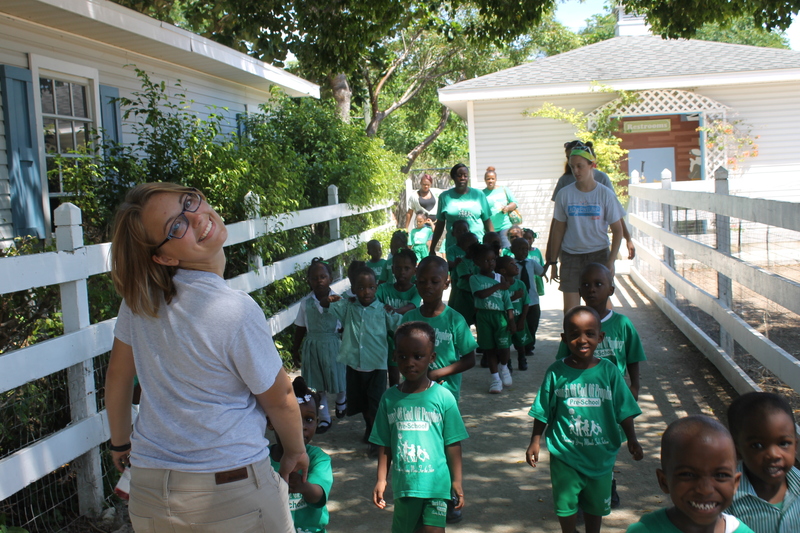 A second birthday in the Bahamas! 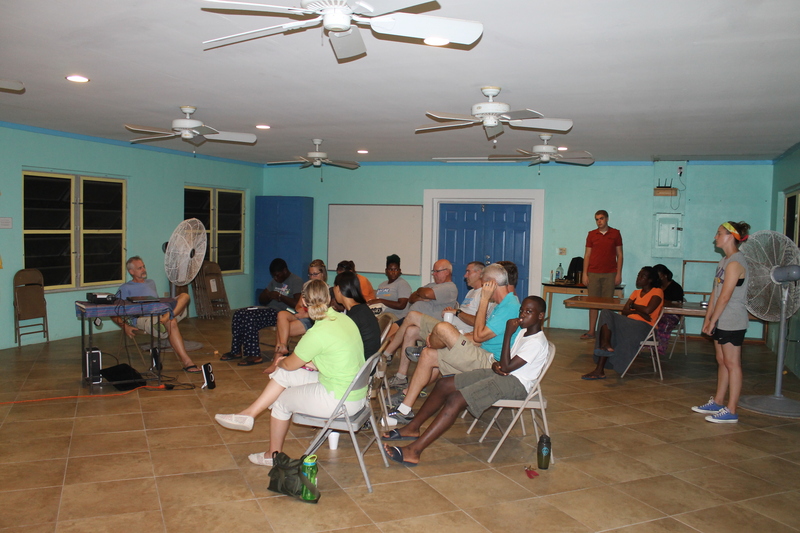 We have been getting together on Monday nights for the Truth Project. No birthday is complete without a birthday cake. 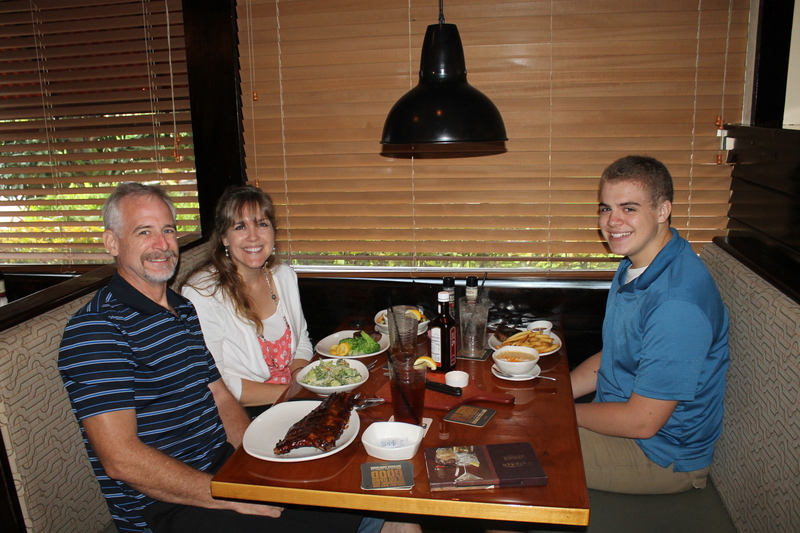 We took Zachary out to Outback Steak House for his birthday. Taking the boys out to eat for their birthdays is a tradition we have always observed. 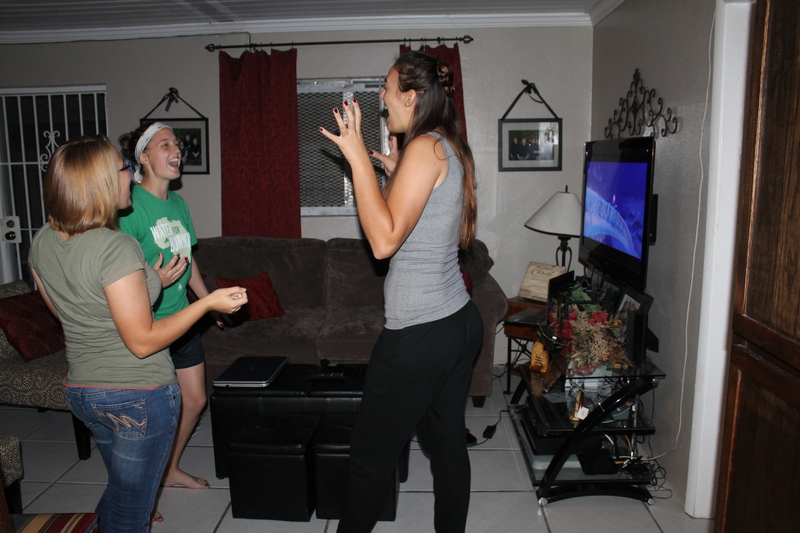 This year it was weird being just the three of us. 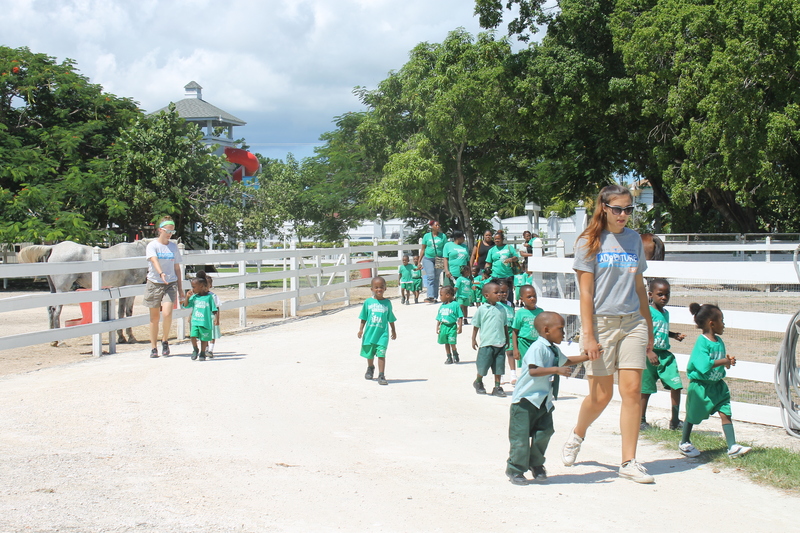 Children began arriving at the Centre for school field trips at the beginning of last week. 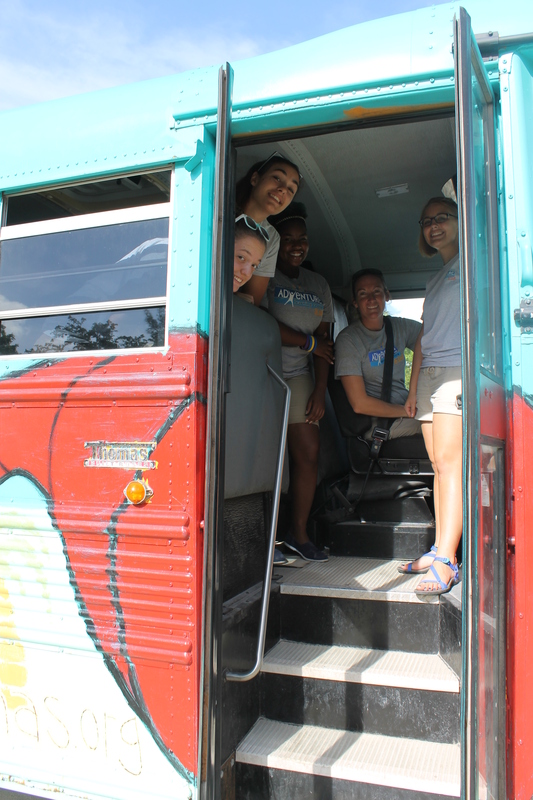 The ALC bus goes to their schools and picks them up! After their first day of live programming! Come on girls, this is only the beginning! Our new facilitators get to go with our veteran facilitators as they pick up the children. There was a lot of preparation work that needed to be done to get ready for the Joy Bible Camp Reunion scheduled for September 27th. 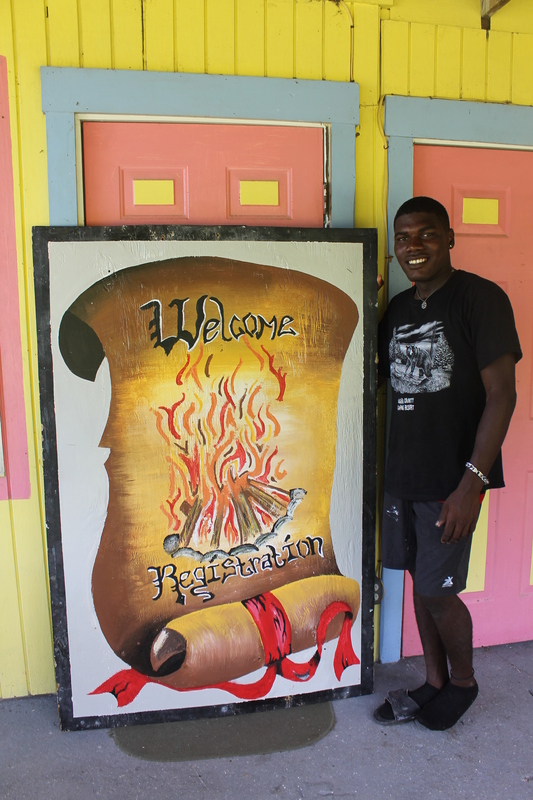 Kevin Poitier is an artist and helped by painting this sign. Well done, Kevin! This is the Skag lawnmower we got at a very good price. 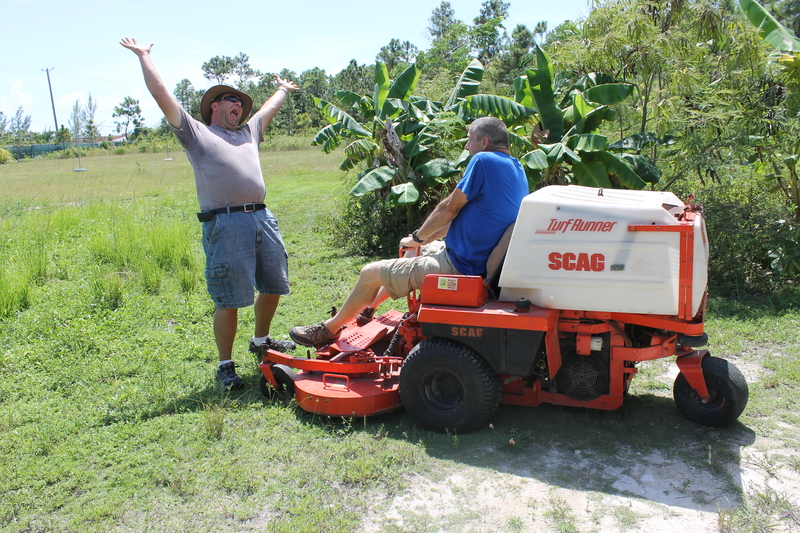 Pat and Bog having fun getting the grounds ready and beautified for the reunion. Kevin had never made cookies before. This is his first attempt. They were good. 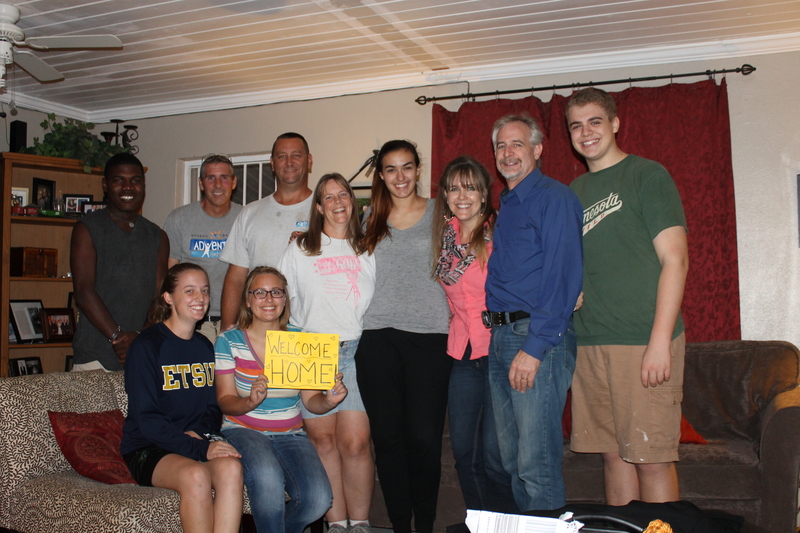 The day of the Joy Bible Camp reunion arrived on September 27th. 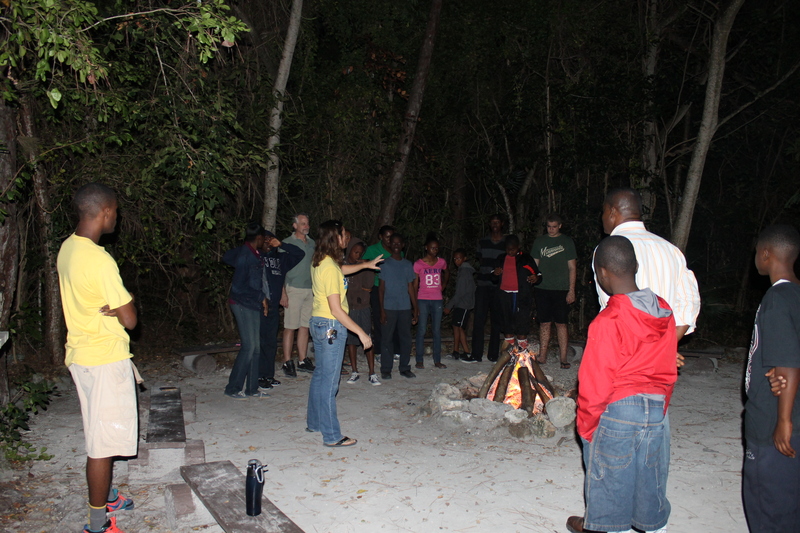 We began with a pow wow and time of prayer. It was a joy seeing people come through the front gate. Some anxously waited in the dining hall meeting area for the program to begin. Others killed some time shooting baskets. We began the open house with introducing ourselves. 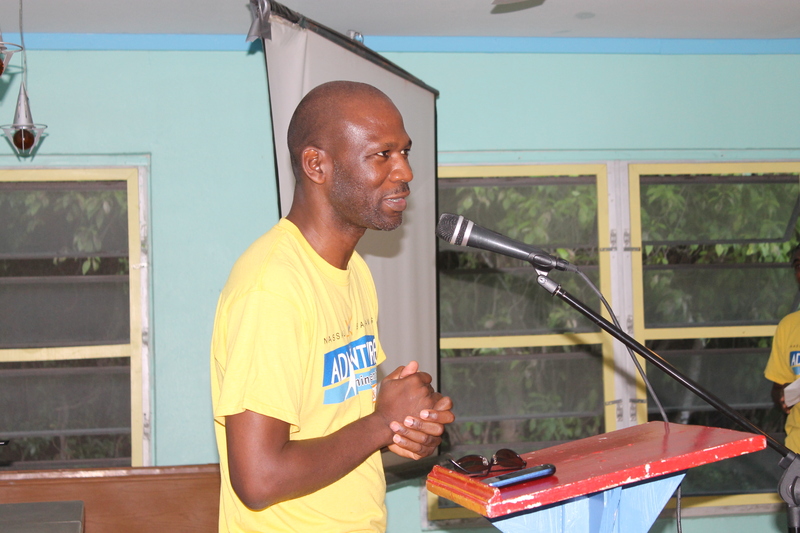 Leonard Smith was our moderator. 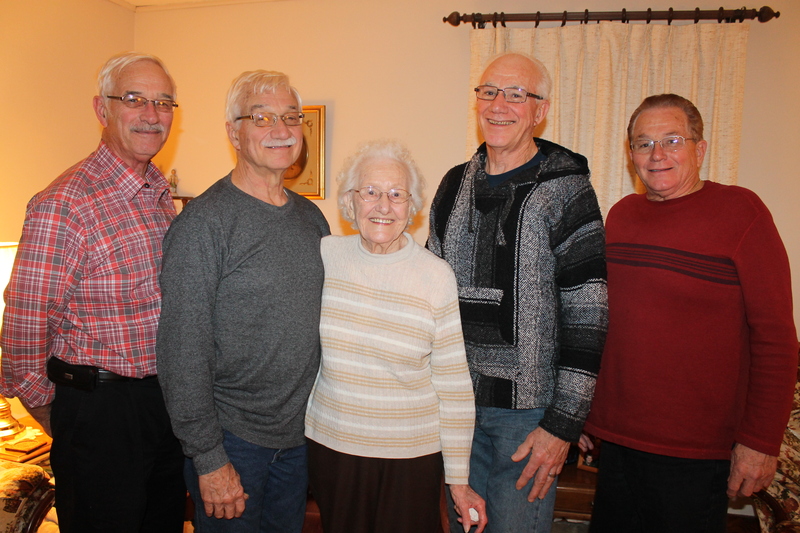 He and his brothers spent many of their summers at Joy Bible Camp while growing up. 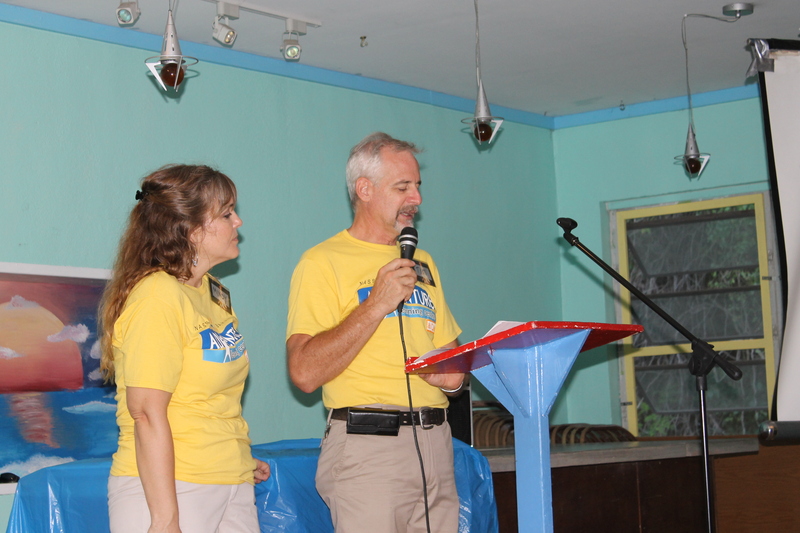 Moya and Micheline led all of us in songs they used to sing at Joy Bible Camp. 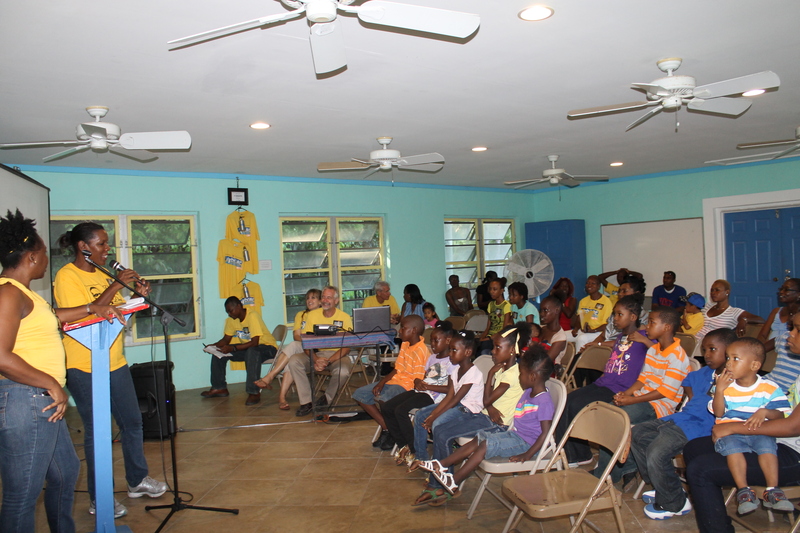 Stanley Rolle shared some memories of Joy Bible Camp. He led us in some of his favorite songs. The microphone to s open for any past Joy Bible Camper or staff to share memories of their time at JBC. This is Nancy Hutchinson. 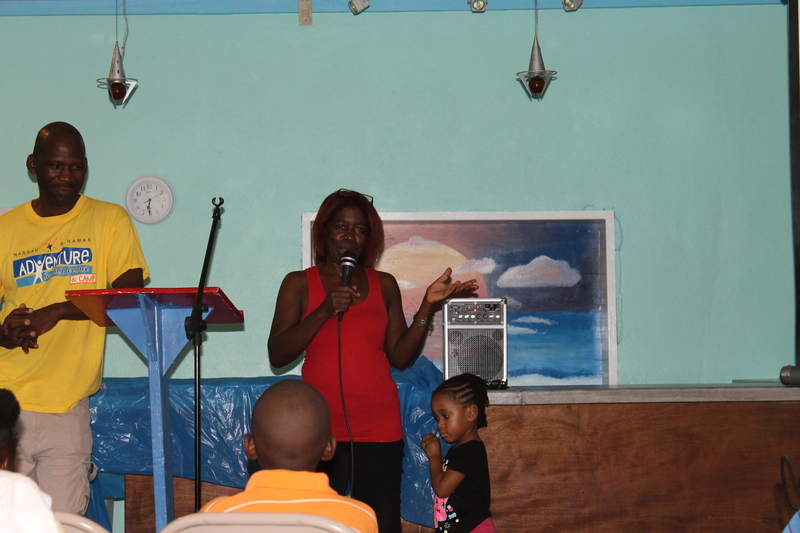 She is so excited that we are starting an out reach for the young people of the Bahamas at ALCamp. She has 2 teenagers of her own and wants them to have the same experiences she had. This is Marie. She was Aunt Audrey’s “right-hand man”. She shared some experiences with all of us. More singing led by Moya and Michelene. 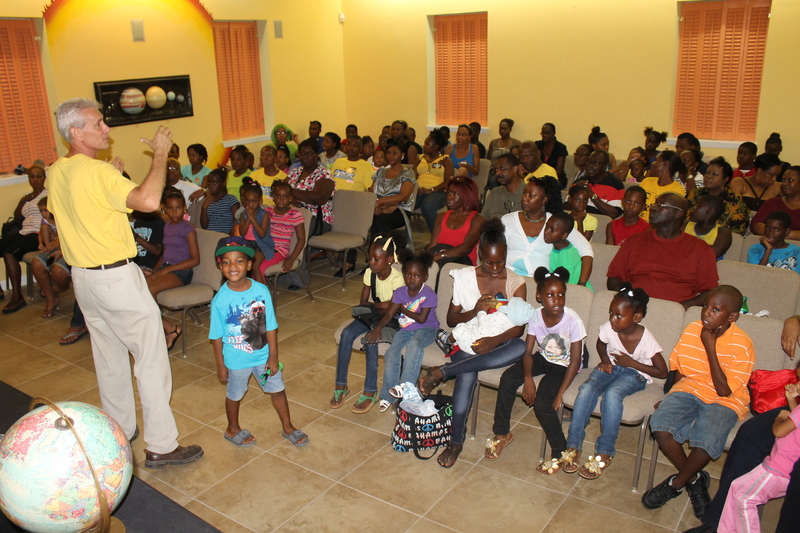 Tim was able to share the goals and visions of Adventure Learning Camp and our desire to start a weekly outreach to the young people of the community. Eloise introduced the next activity for the night: tour of the Adventure Learning Centre. 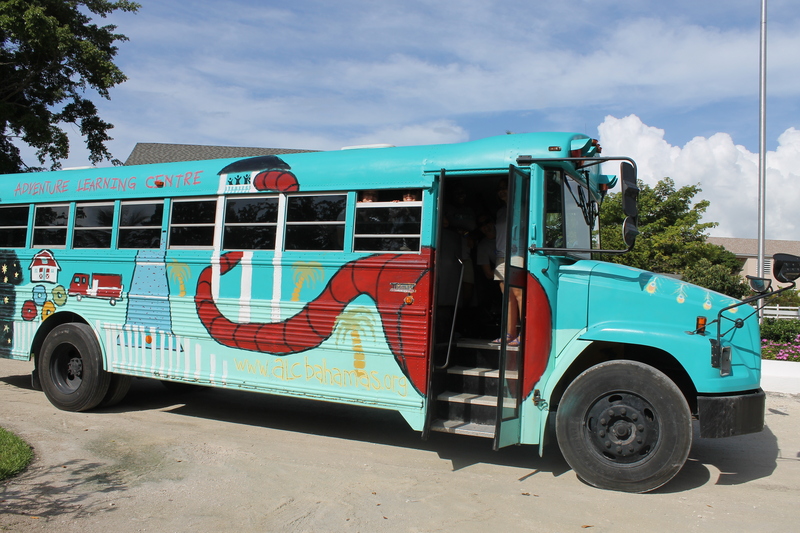 We loaded the bus and headed for the Centre. …and the planetarium. 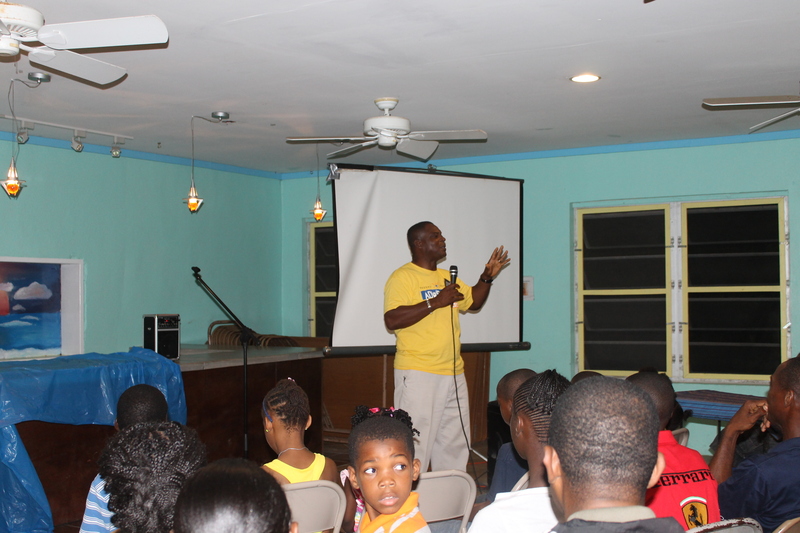 He was able to share with the group what the focus of the Centre is. The Gospel was clearly shared. We returned to the Camp. Where Sydney “Teddy” Bootle gave a meditation. 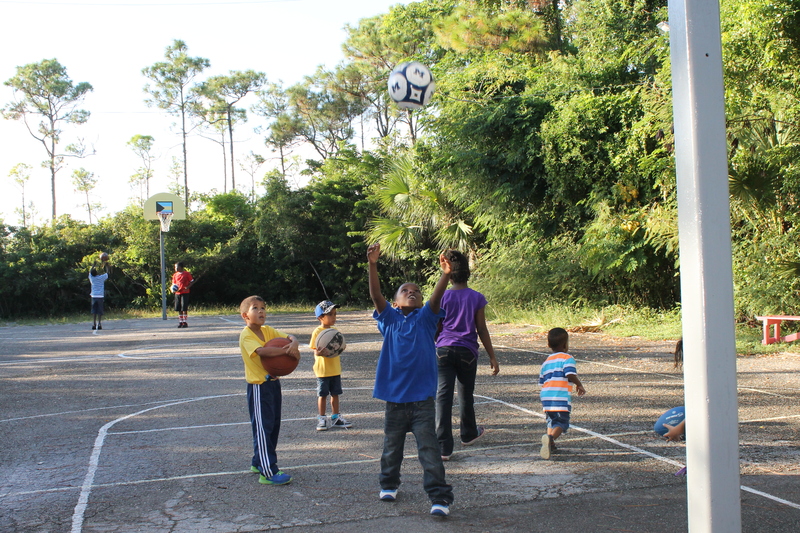 …and tours of the camp facilities! 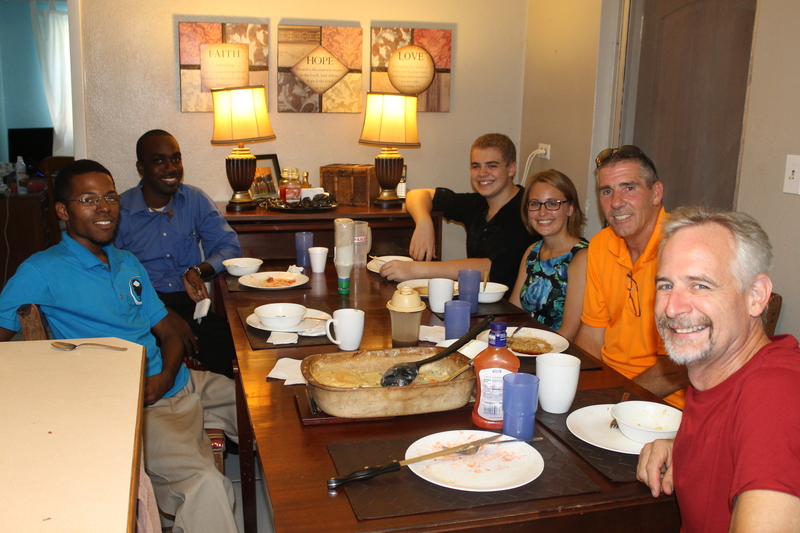 On Sunday we had the College of Bahamas students from our church over for lunch at our house. Pat and Megan joined us. 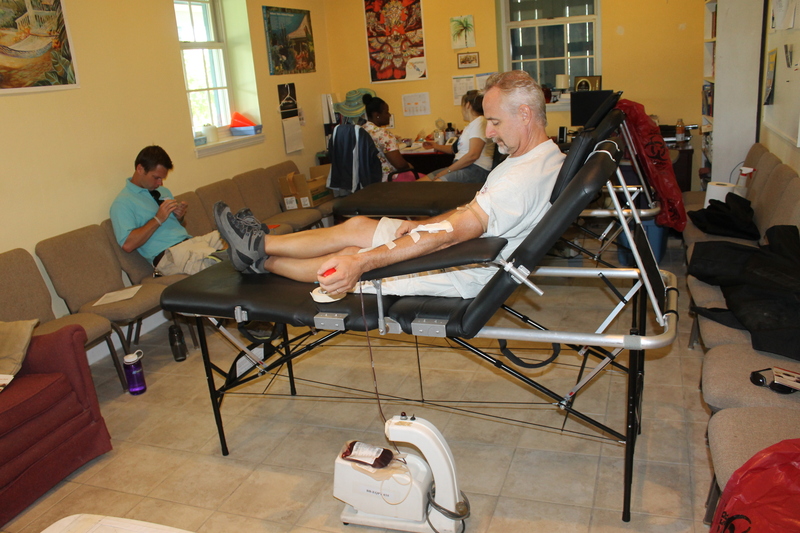 On Monday we had a blood drive at the Centre. Patients at the hospital who need blood must have family and friends donate blood on their behalf before they can receive blood. We were donating for a little girl with a strange disease. Tim has been building Adirondack chairs. 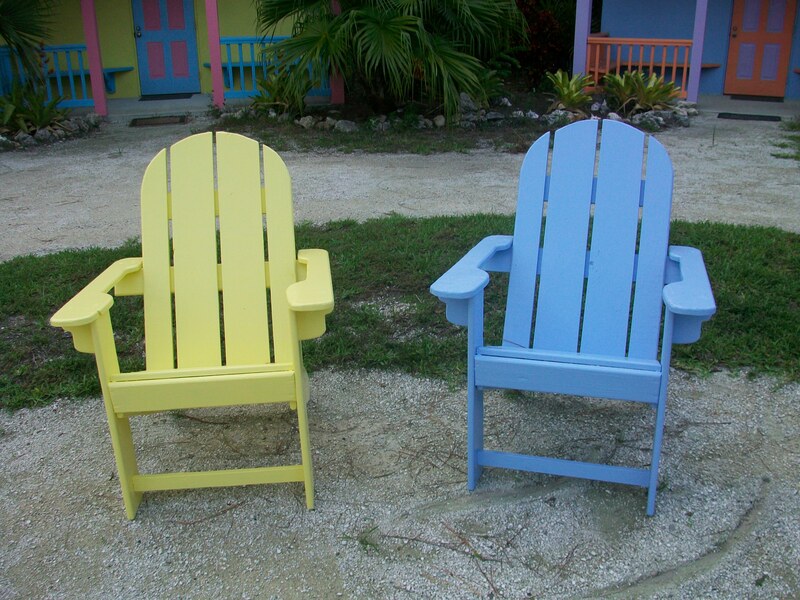 We have six cabin colored chairs and 4 white chairs. Tim has had some help in making these. 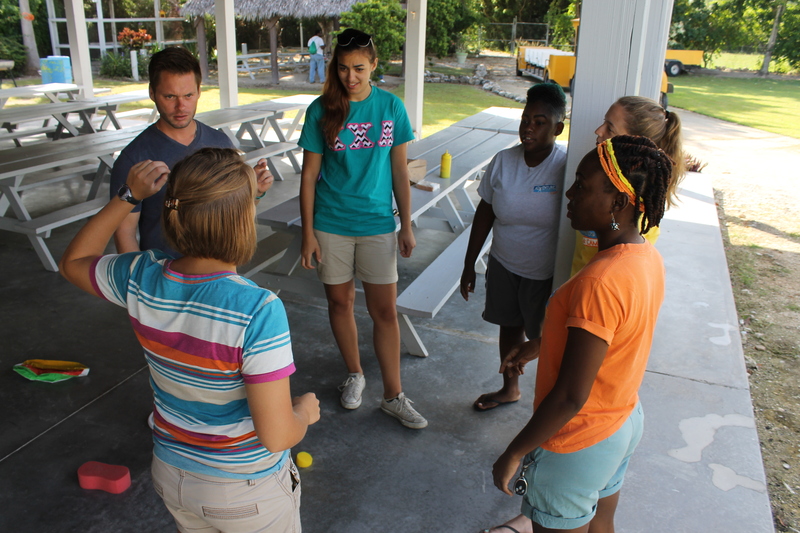 Our new facilitators have had plenty of opportunity to teach this past week. 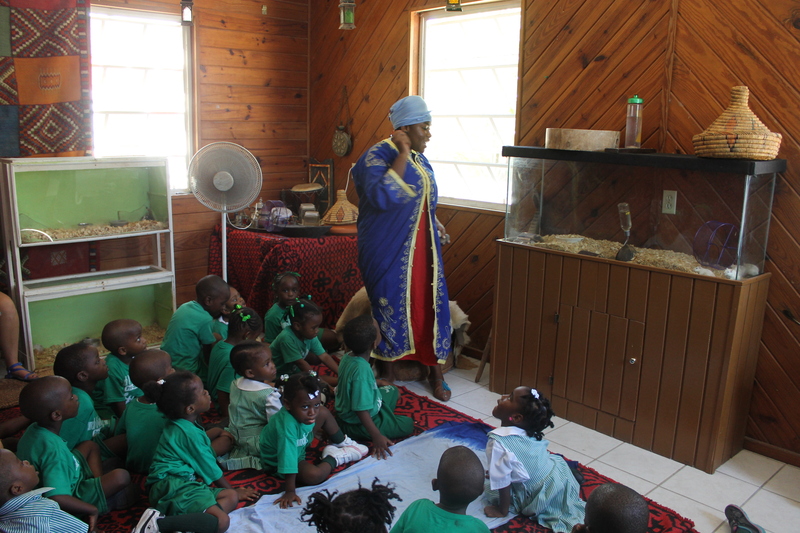 Tika in character as she teaches programs to the children at the Centre. 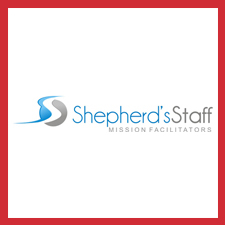 Can’t wait to connect mission teams with this ministry! Great Commissions Ministries is a local ministry serving children, the poor, the homeless, the hungry, drug addicts, and gang members. They are doing a great work. We met with the director of this ministry and a man who benefited from the ministry during a rough time in his life and who has now started serving the Lord full time with this ministry. 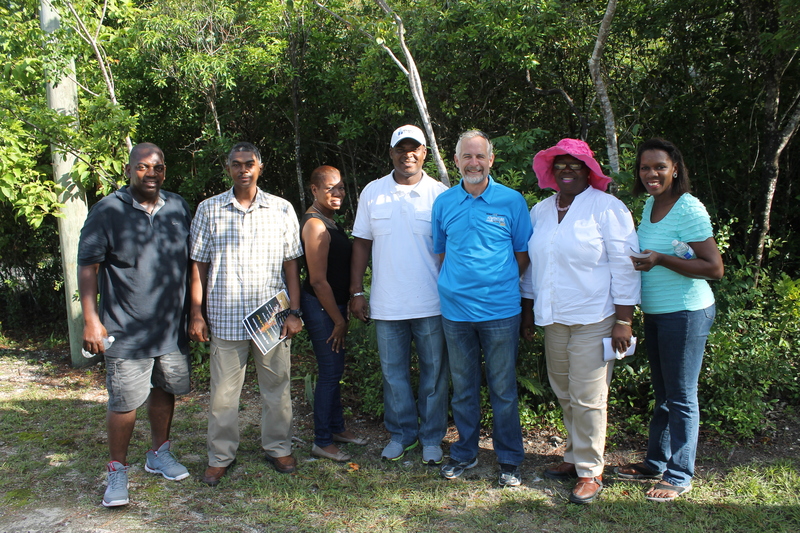 There is a great need at this ministry, and any work done will benefit Bahamians on a much broader scale than other ministries we have worked with in the past. This slab is the proposed site of a kitchen/pantry extension. The ministry feeds many homeless people, and the kitchen they use is not much bigger than the kitchen in my house. They NEED this extra space! 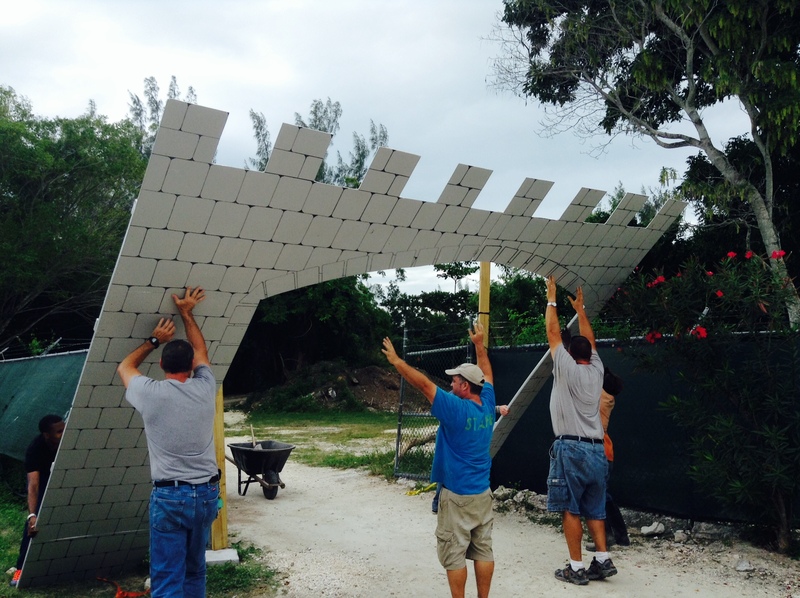 Another angle of the slab that needs a building raised on it! Anyone want to come and build this ministry an extension to their kitchen and a pantry? The two new animals added to the Centre’s petting farm. Except you probably won’t want to pet these critters. They are Indian Crested porcupines. 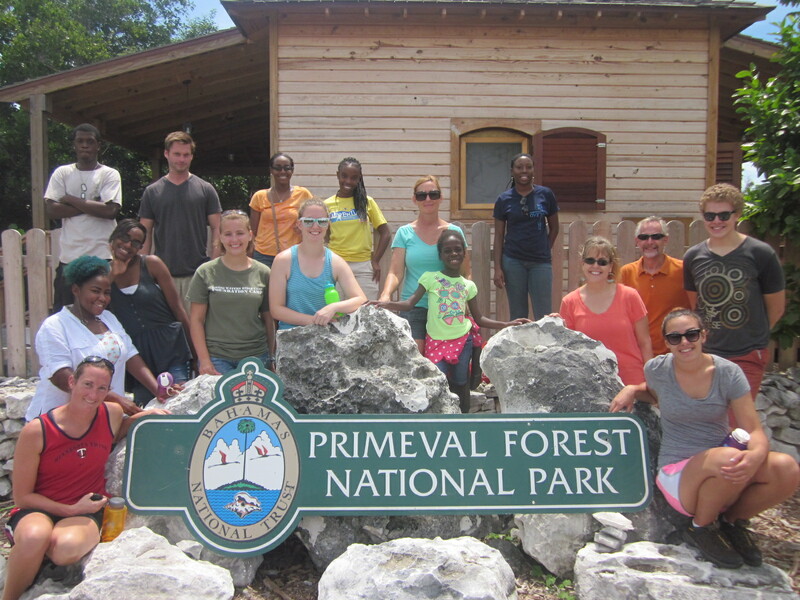 On September 7th the ALC&C staff had a day out together at the Primeval Forrest. On Friday, September 12th Lagloria brought Letitia and her daughter for a visit while they waited for the facilitators to finish their day at the Centre. 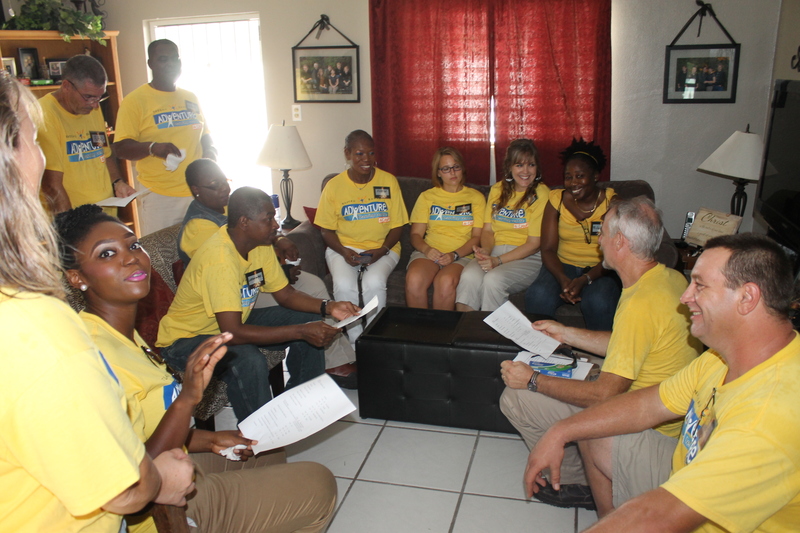 Saturday the 13th was the first neighborhood canvassing to hand out Joy Bible Camp Reunion flyers. 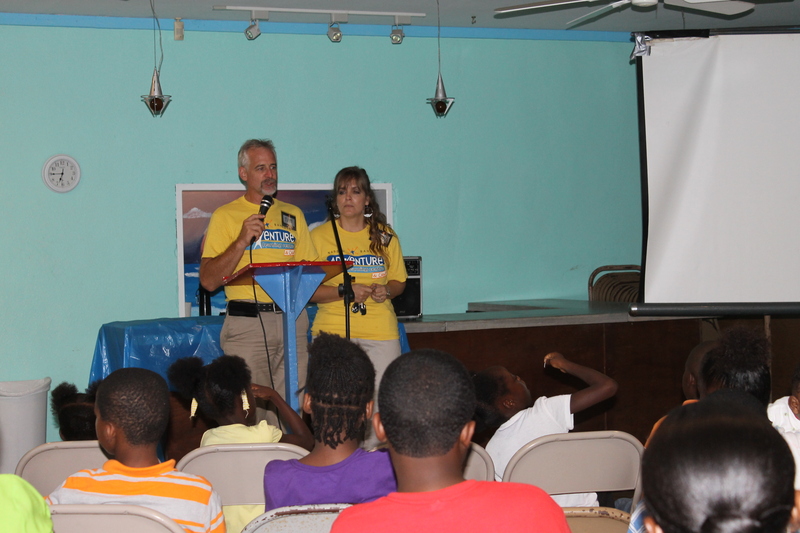 Past Joy Bible Camp campers/staff and we handed out over 300 fliers to one South Beach neighborhood. See one of Zachary’s designs! 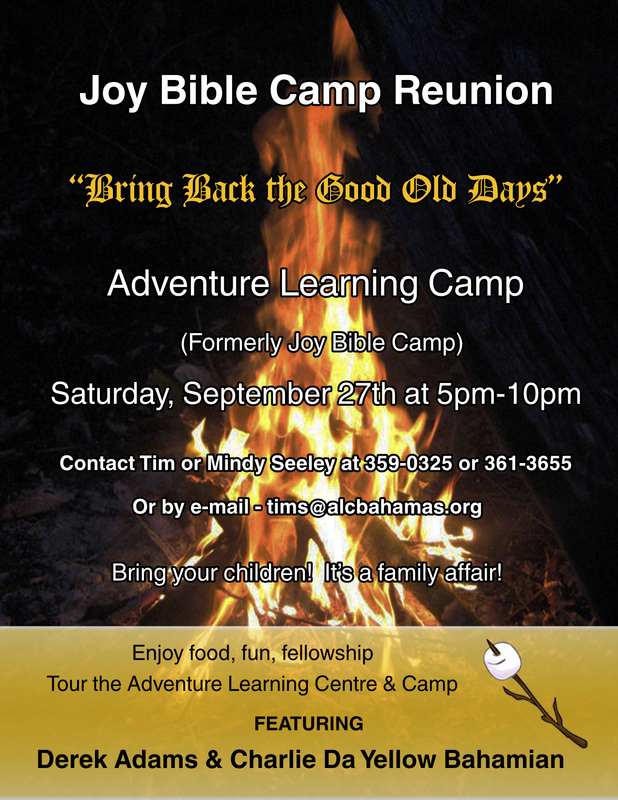 This is the flyer we handed out announcing the Joy Bible Camp reunion. 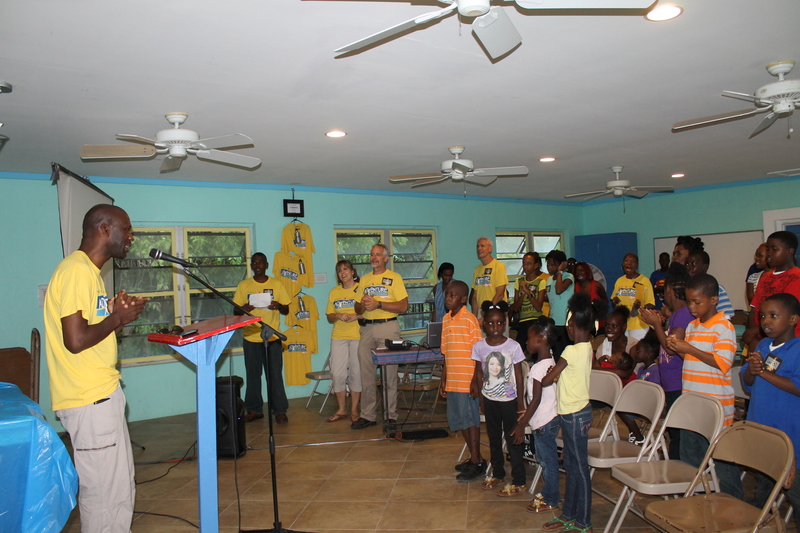 On Sunday, September 14th we joined East Street Gospel Chapel for their Sunday morning worship service. 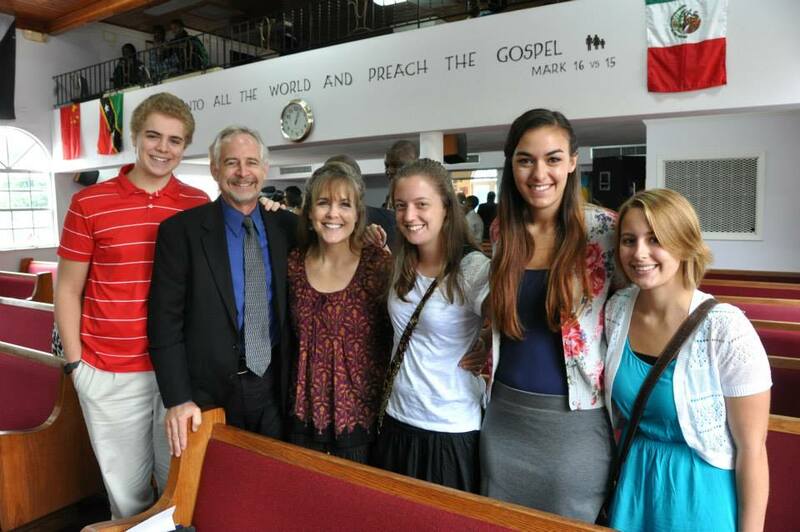 We took Sam, Josie and Megan with us to have a different church experience. 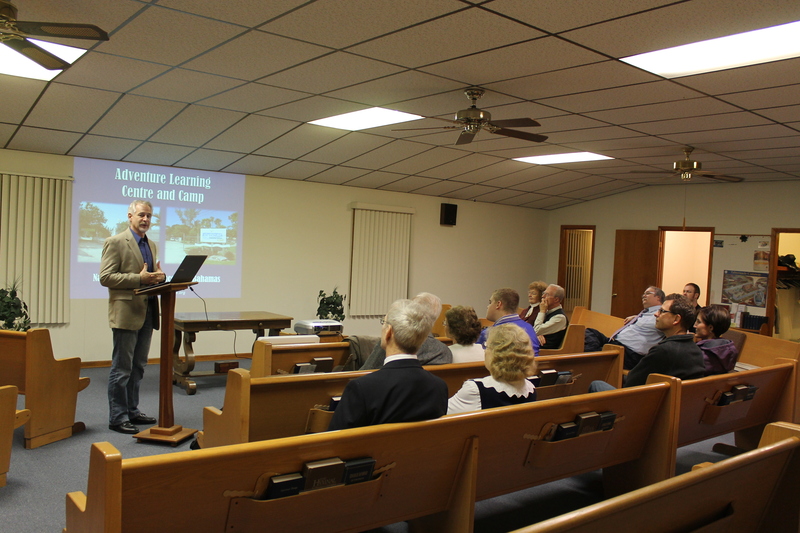 It was ESGC’s missions conference, and Tim was able to give a 5 minute ALC&C update. 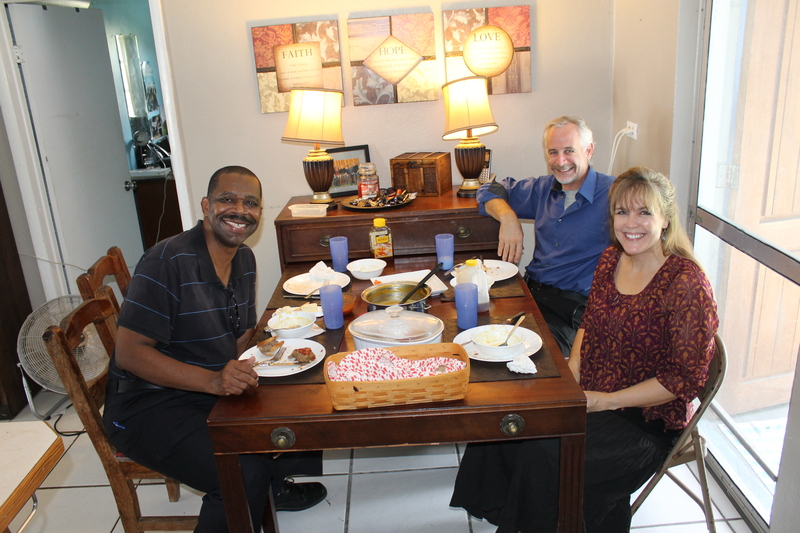 After the worship service at East Street Gospel Chapel, Brother Bradley King joined us for lunch and time of fellowship. Tom came back to volunteer for a couple of weeks. 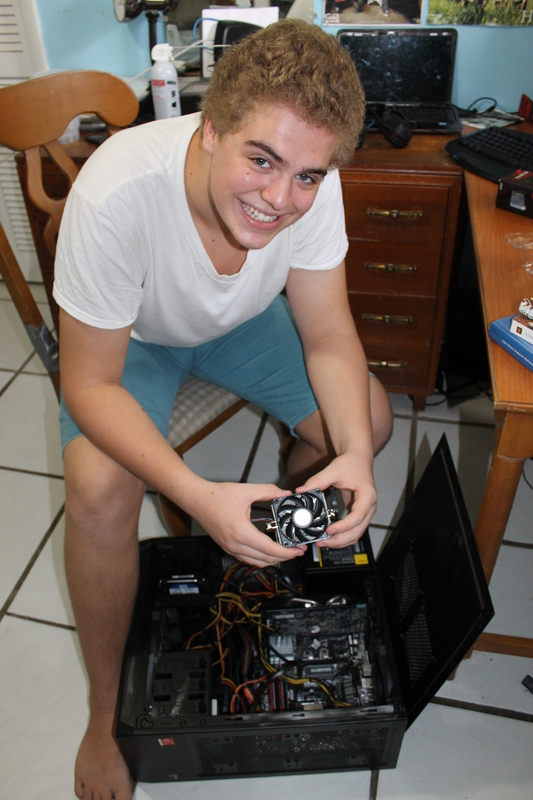 Tom brought back a replacement processor for his computer. We started watching and discussing the Truth Project again on Monday nights. Kevin came back to the island after being away for a couple of months working at a camp in Baltimore. He came this week to stay with Tom while he is on the island. 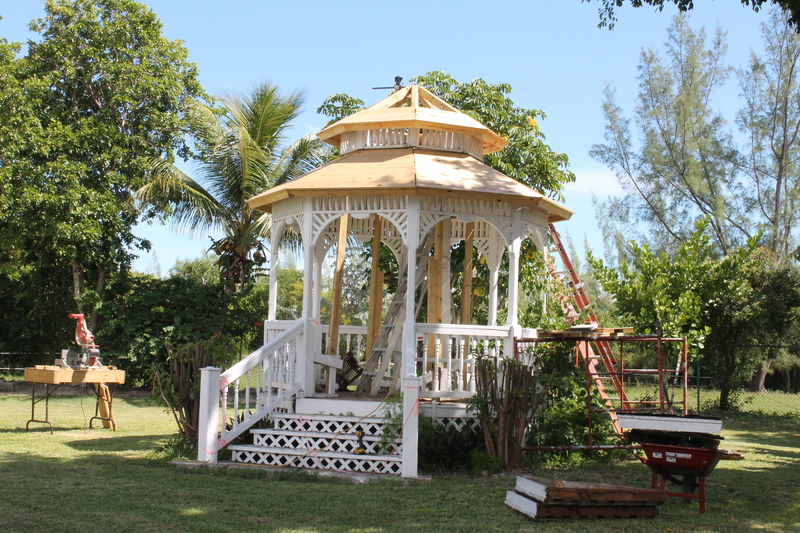 The Amberly Grebe memorial gazebo has been in a state of disrepair for a while. Bob Balson and Tim Ryan have been making repairs to it. 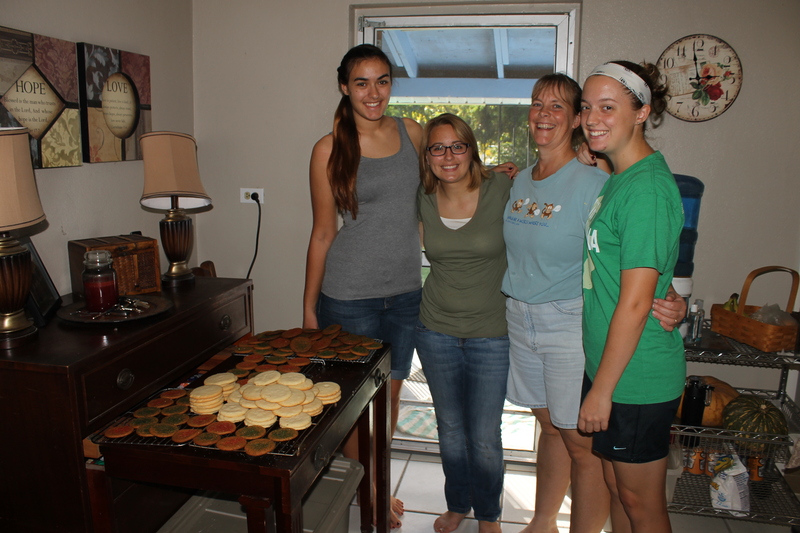 This past Wednesday we hosted Richard (left), Christy (center), and Elke (right) from Florida for a day. 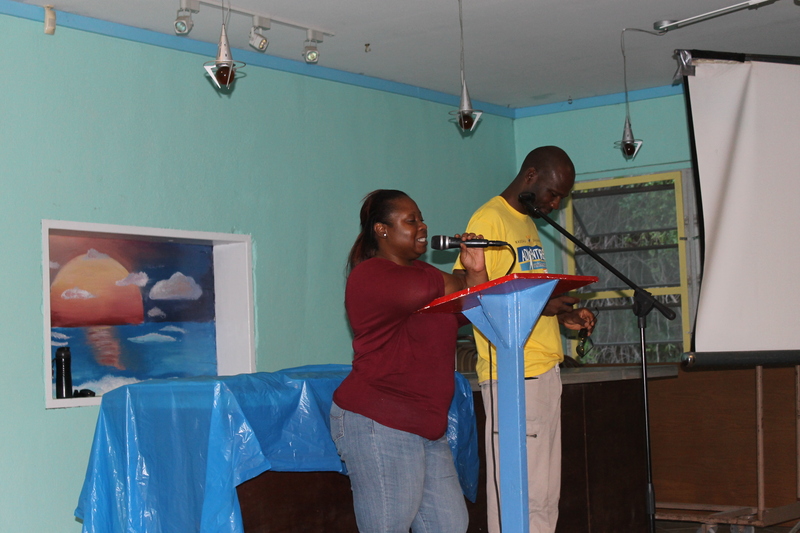 They came to bless and encourage the ALC&C. 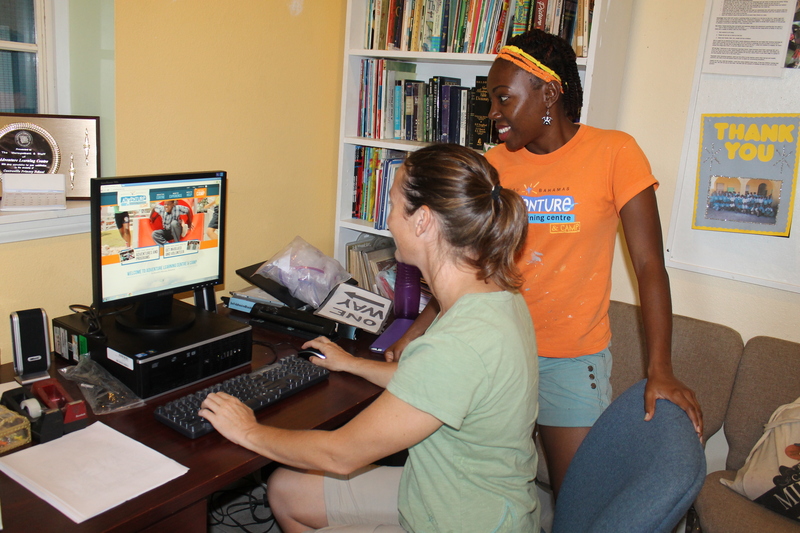 They brought 2 computers for the Centre, a small keyboard and sound system for the Camp, and a few “goodies” for the staff. We enjoyed the time of fellowship with the three of them and look forward to future partnerships. 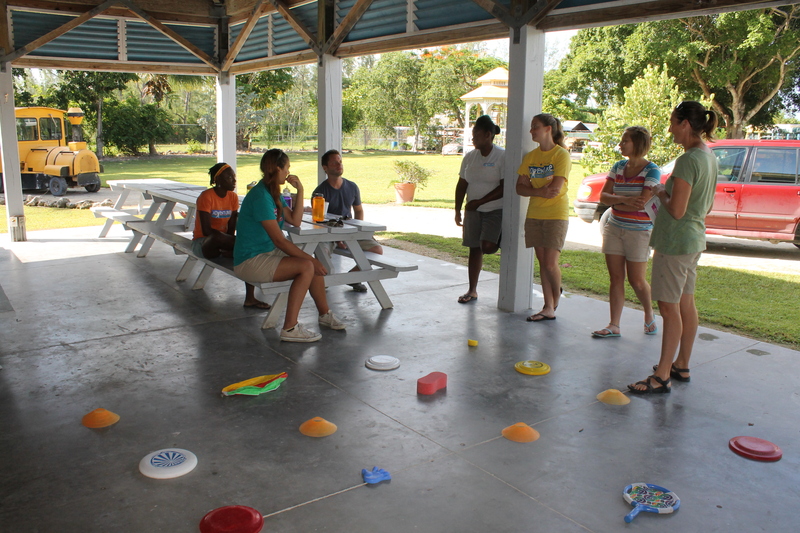 The facilitators at the Centre have been working on training for programs as well as doing team building exercises. Jen is explaining the activity. Strategising how to do this game.